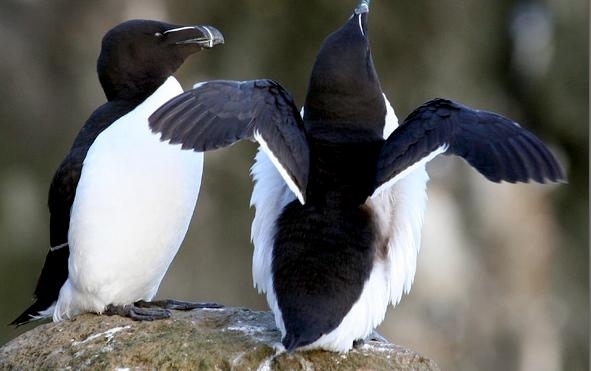 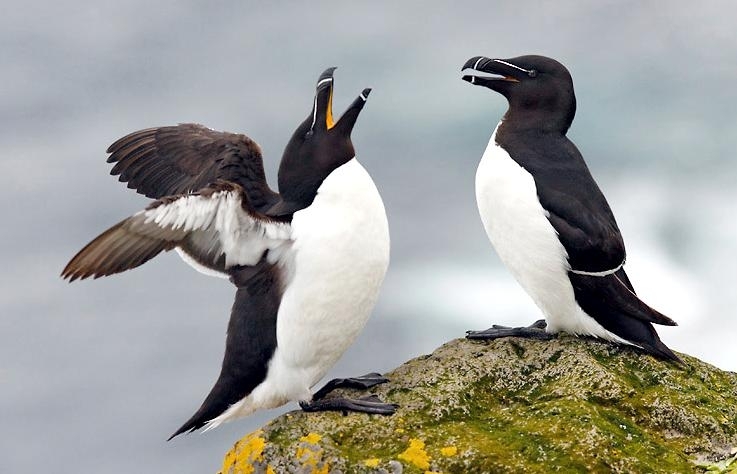 The Razorbill is a short winged diving seabird that is awkward on land and in the air. 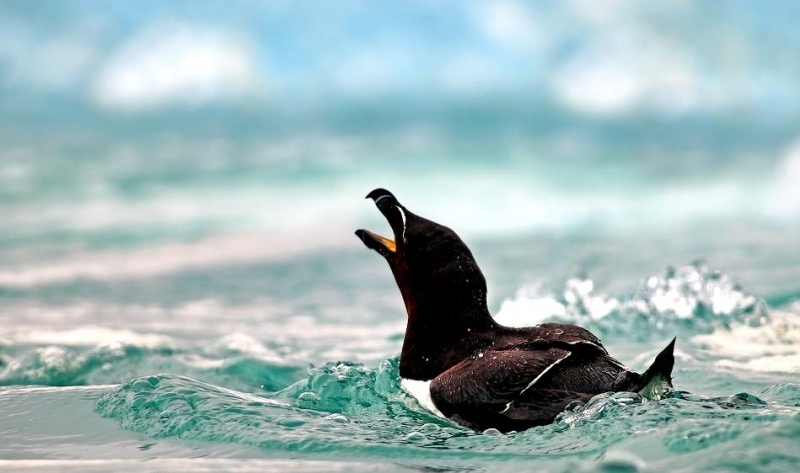 It is more at home bobbing on the sea or diving beneath the surface to catch fish with its hooked bill. 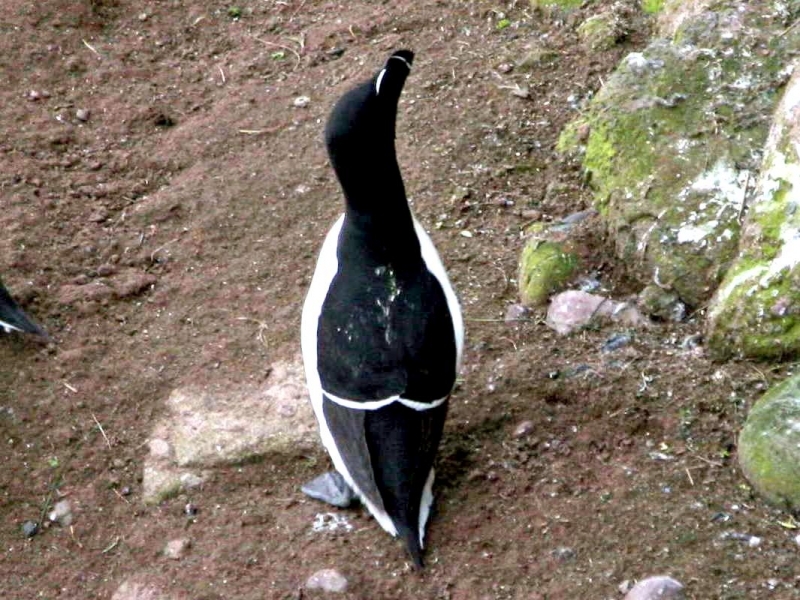 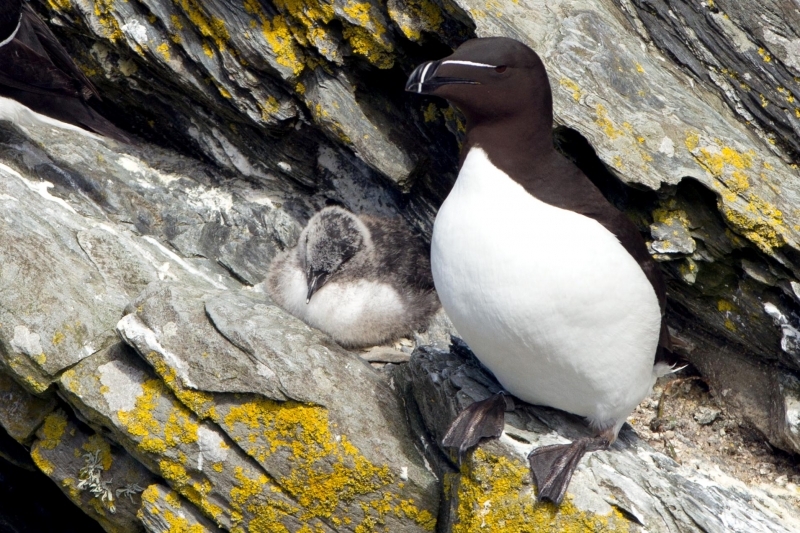 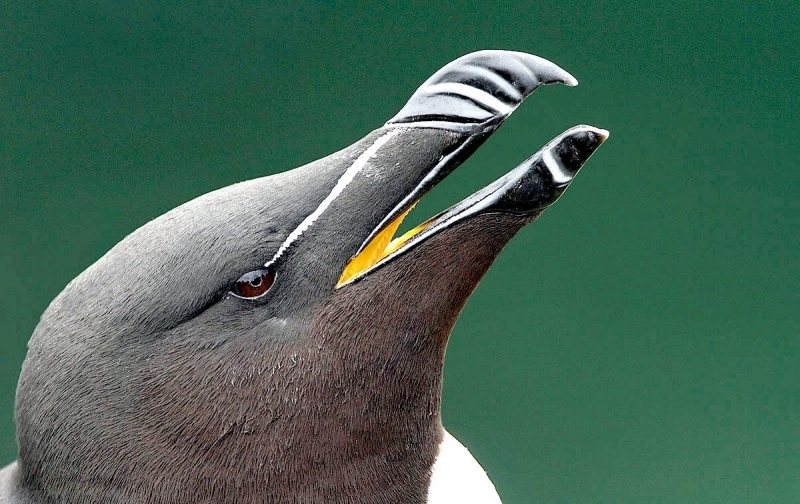 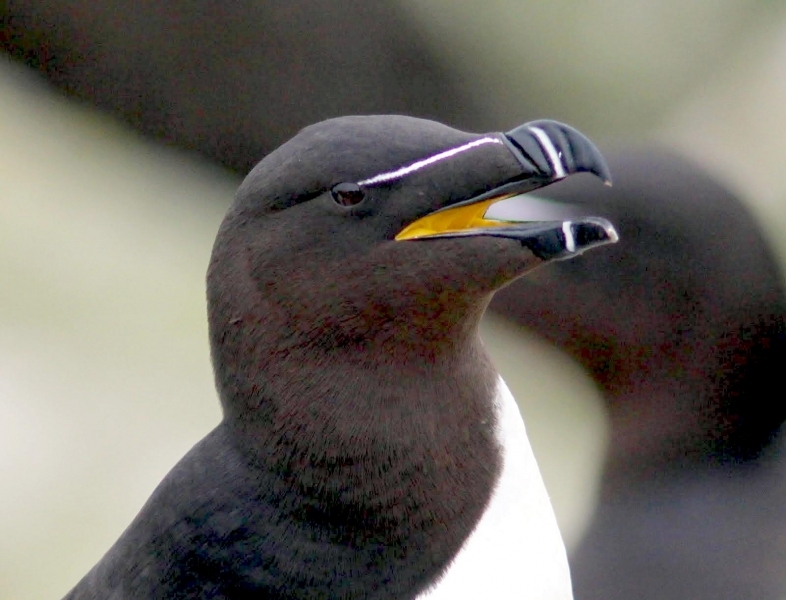 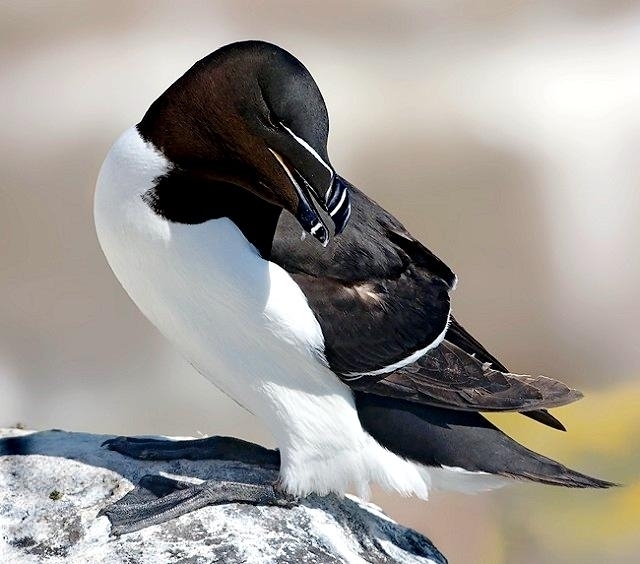 The Razorbill is one of the largest auks, a stocky relative of the Puffin. 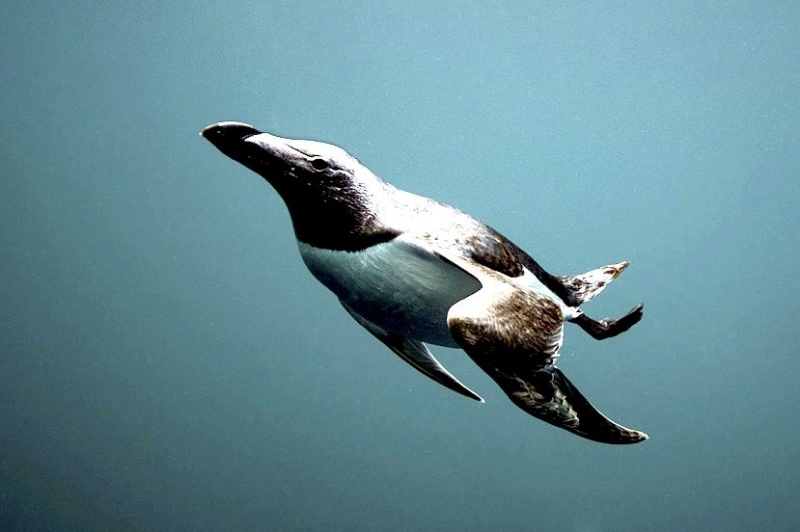 Although barely able to fly and clumsy on land, it is an excellent swimmer & diver and it uses its short wings to glide gracefully underwater. 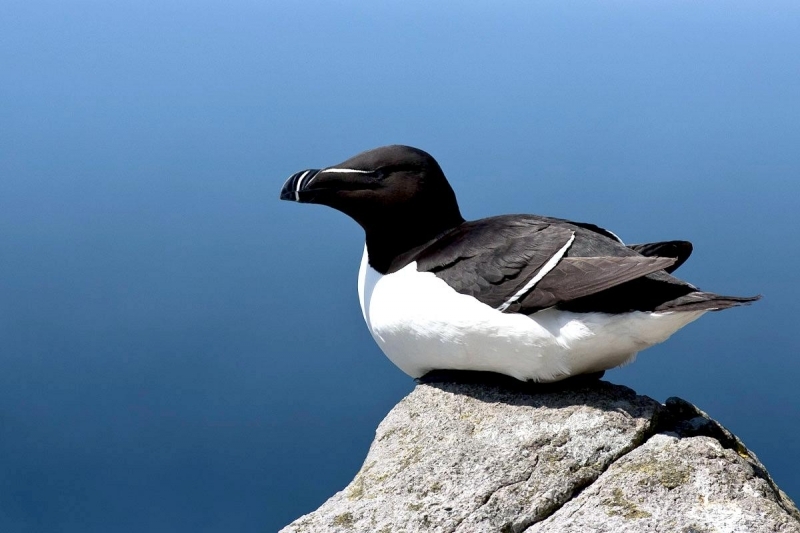 Totally dependent upon the sea for food, the Razorbill spends much of the year far from land, bobbing on the ocean swells and diving for fish. 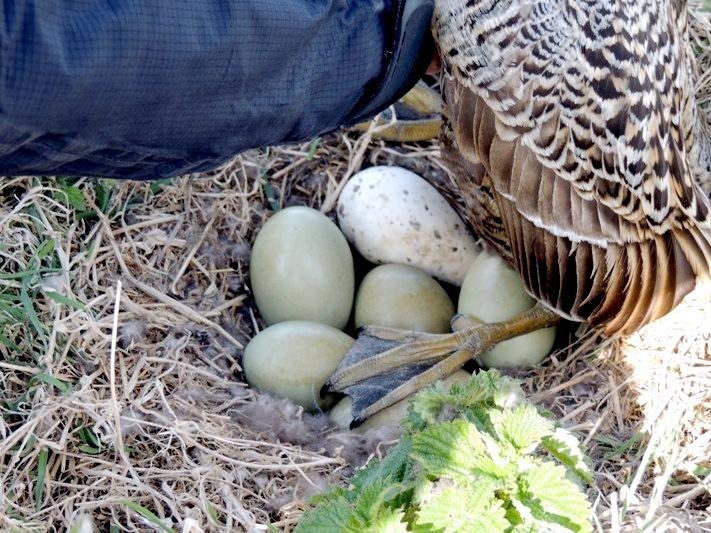 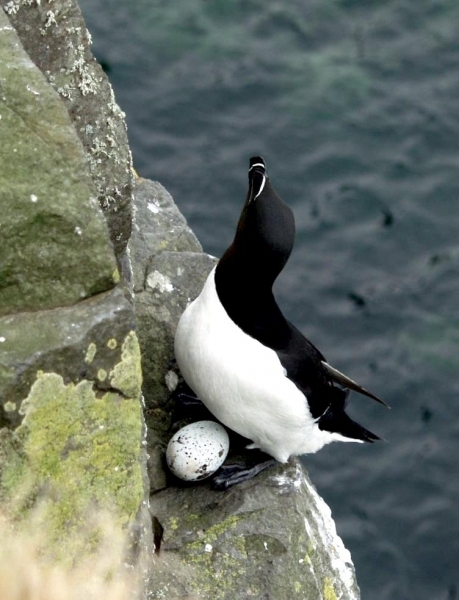 It returns to the shore in spring only to lay eggs and rear its chicks. 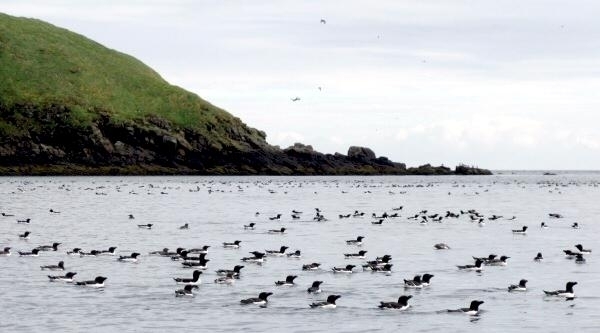 Once the young are independent, they and their parents return to the sea. 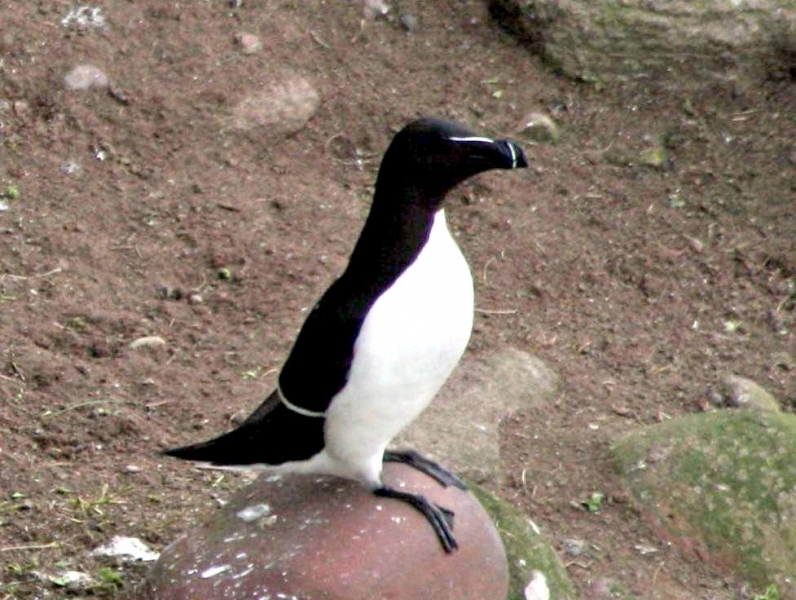 Like other auks, the Razorbill is adapted to life in the water. 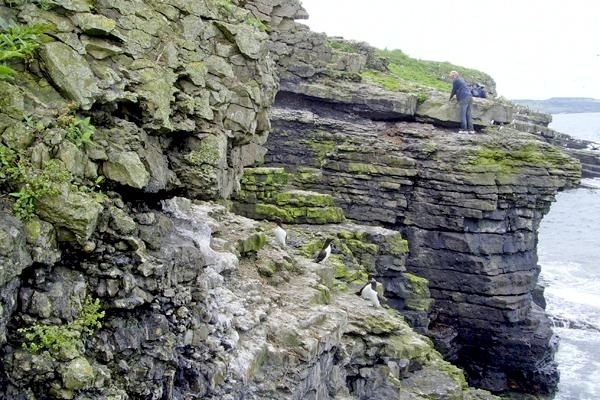 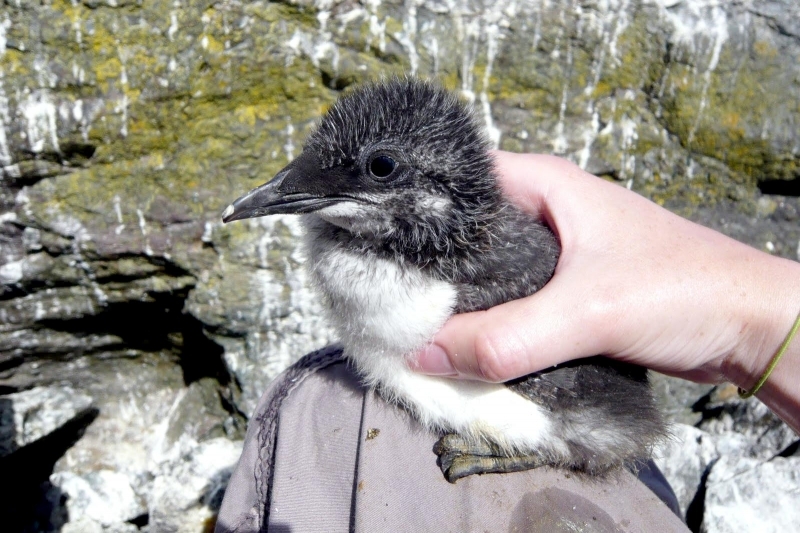 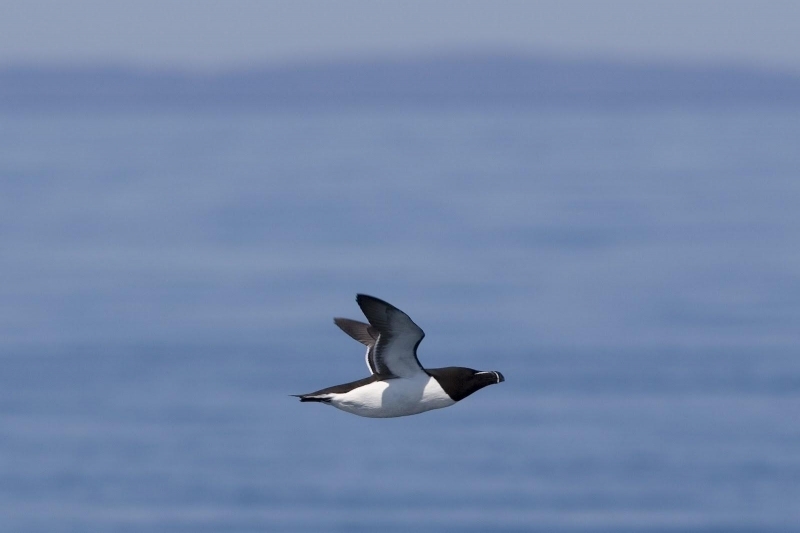 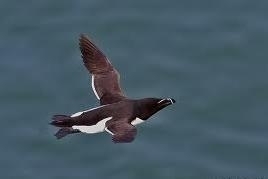 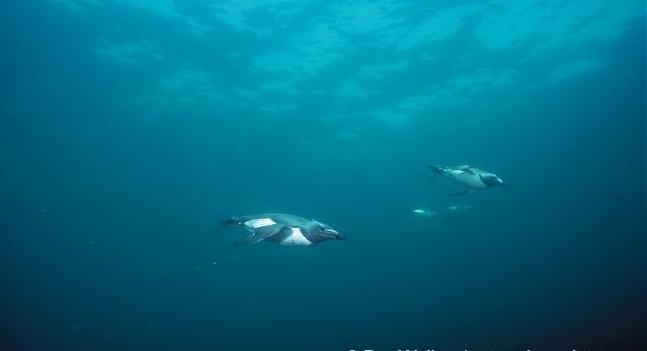 Auks are considered the Northern Hemisphere’s equivalent of penguins which are found only in the Southern Hemisphere. 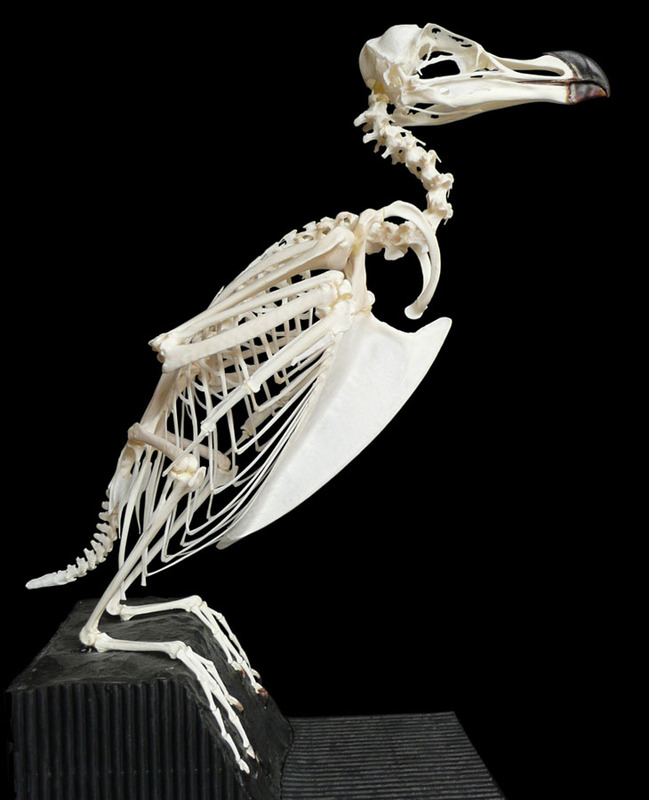 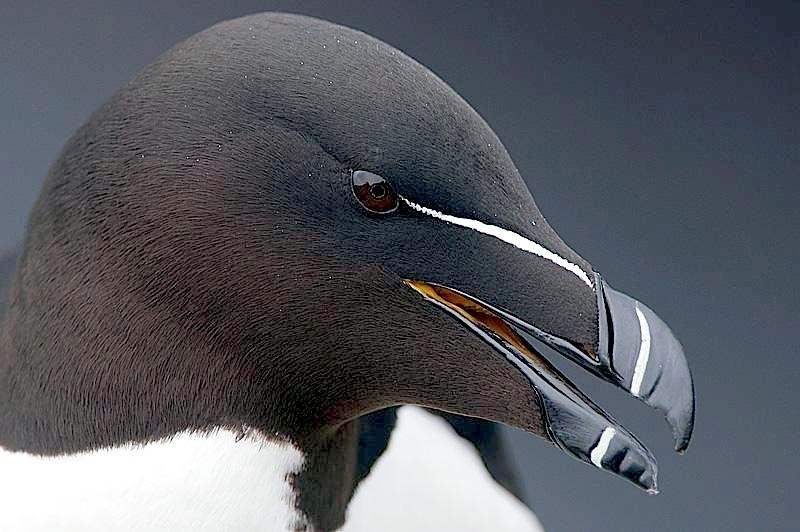 The Razorbill is most like the penguin of all the auks. 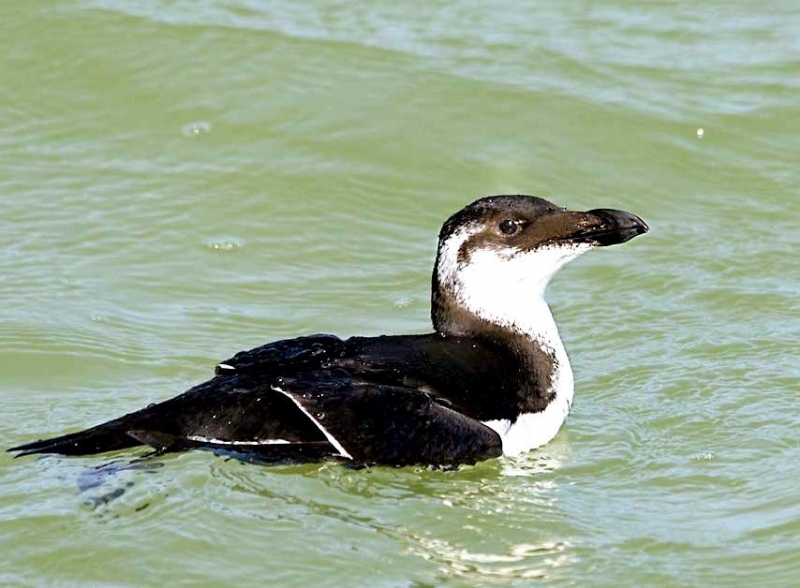 While it is an expert diver & swimmer, it is clumsy on land and has an awkward, waddling, upright gait. 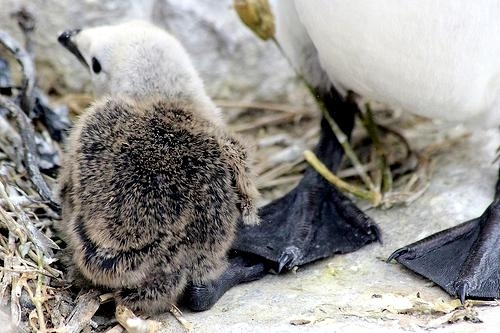 This is because its feet are not well adapted for walking, but rather are set back on its body to act as rudders while it flies and when it swims underwater. 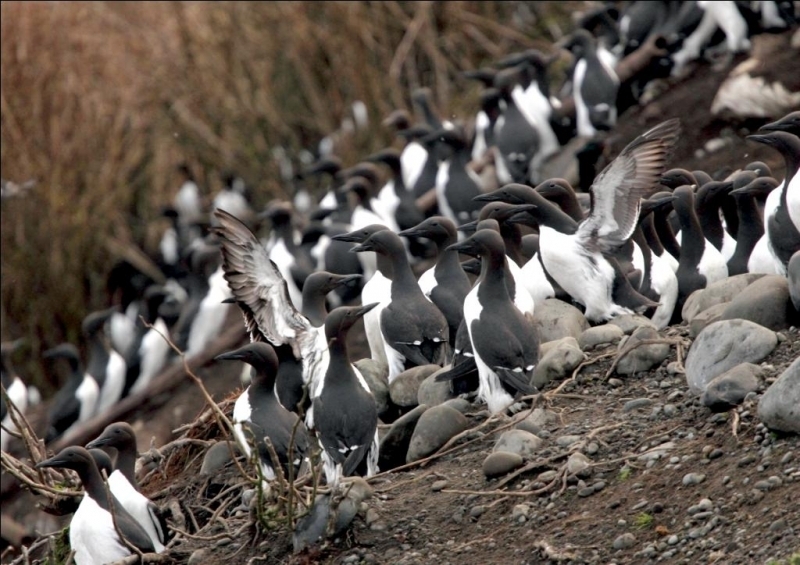 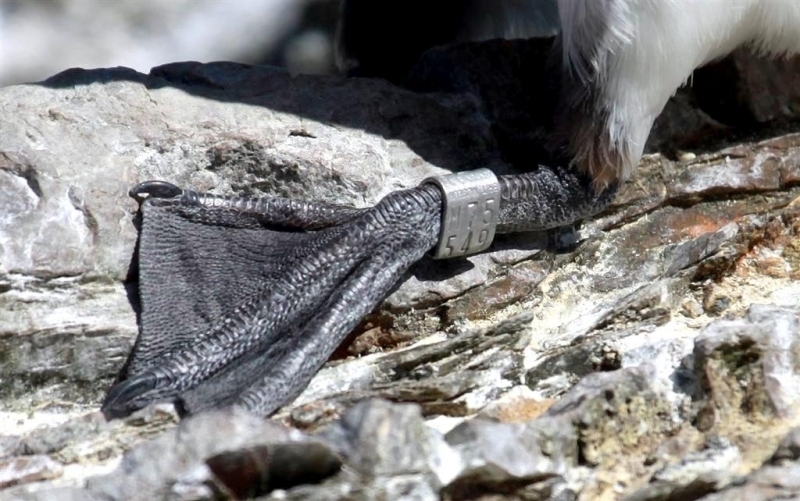 These seabirds must have all their plumage to support them in flight. 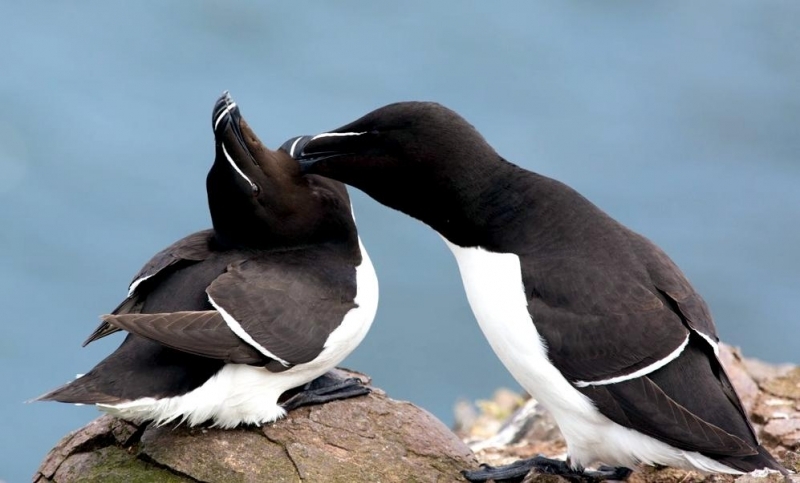 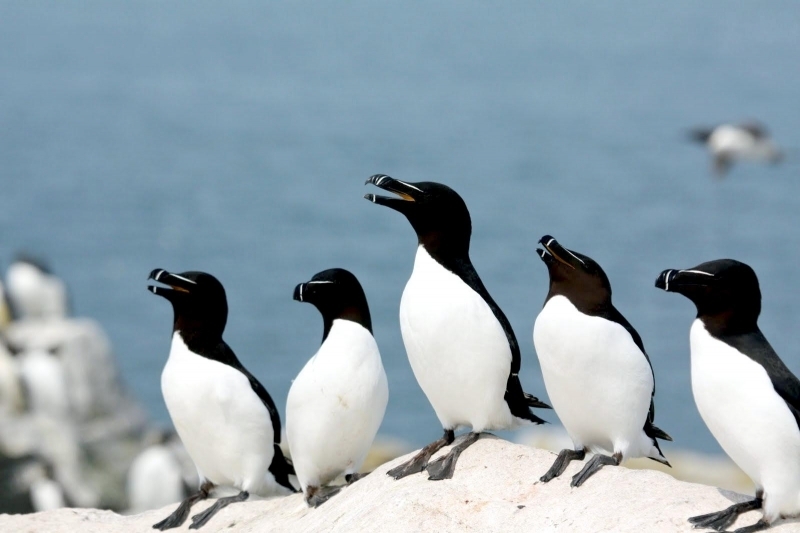 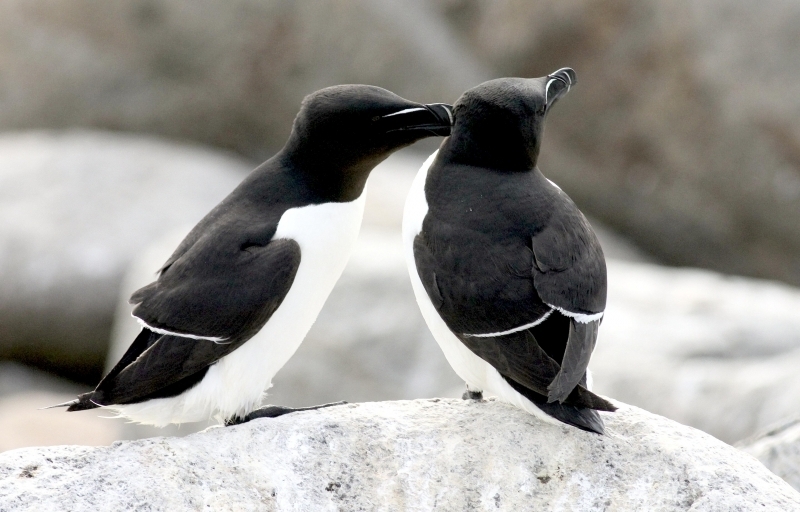 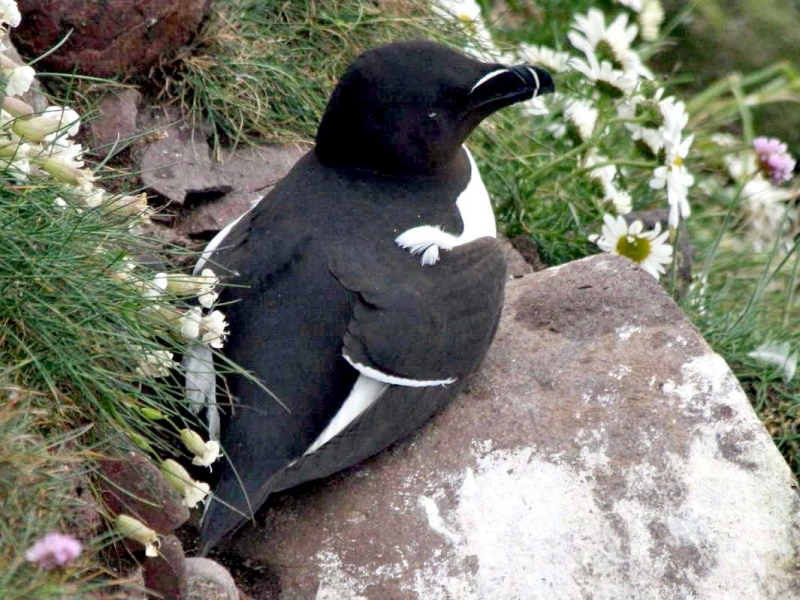 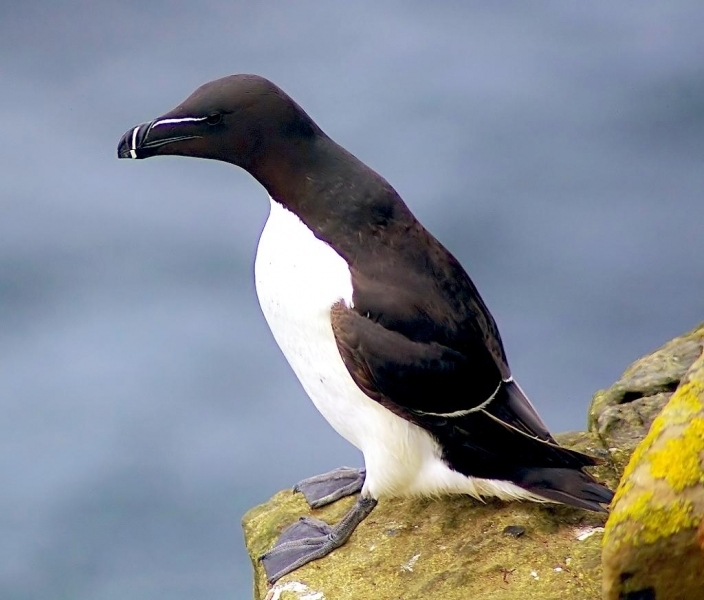 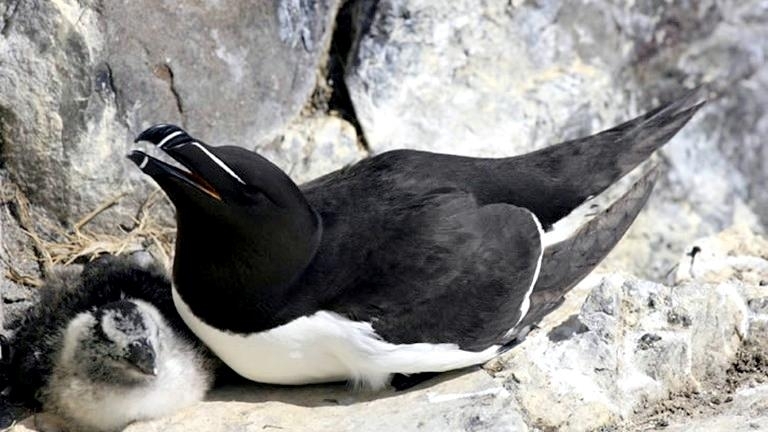 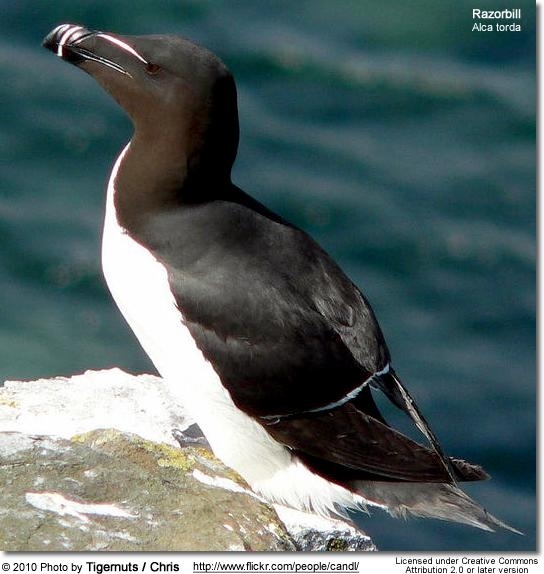 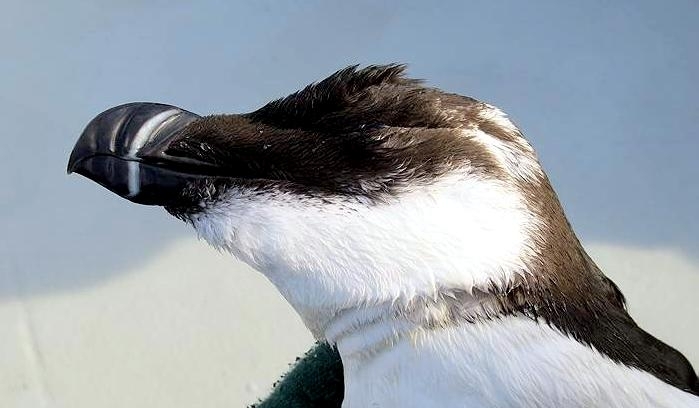 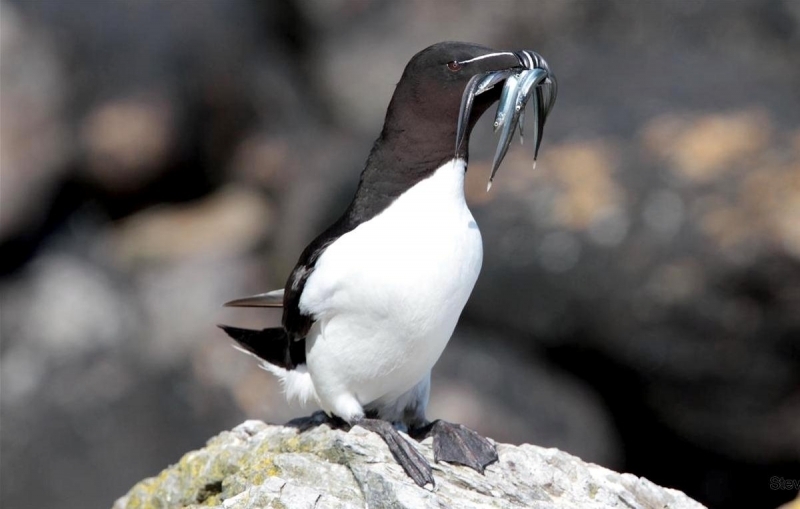 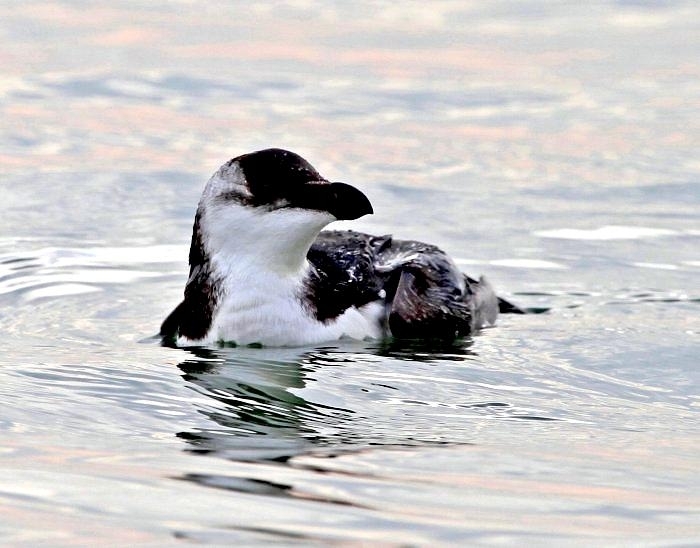 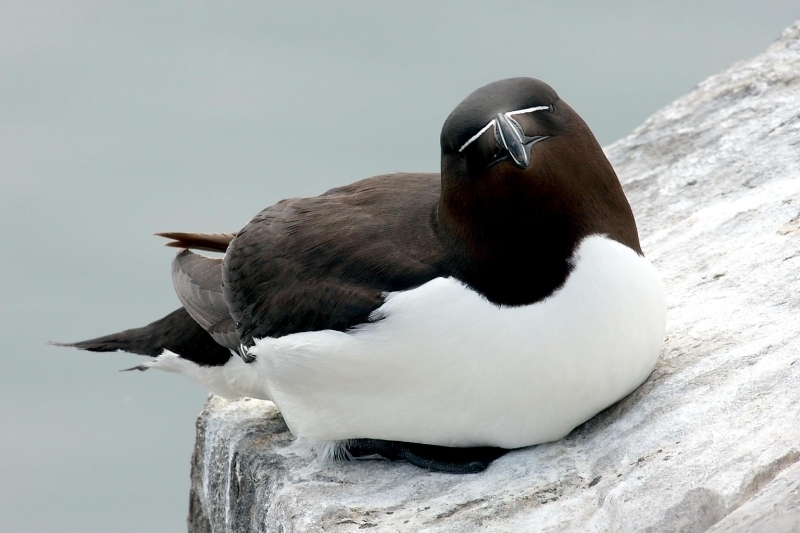 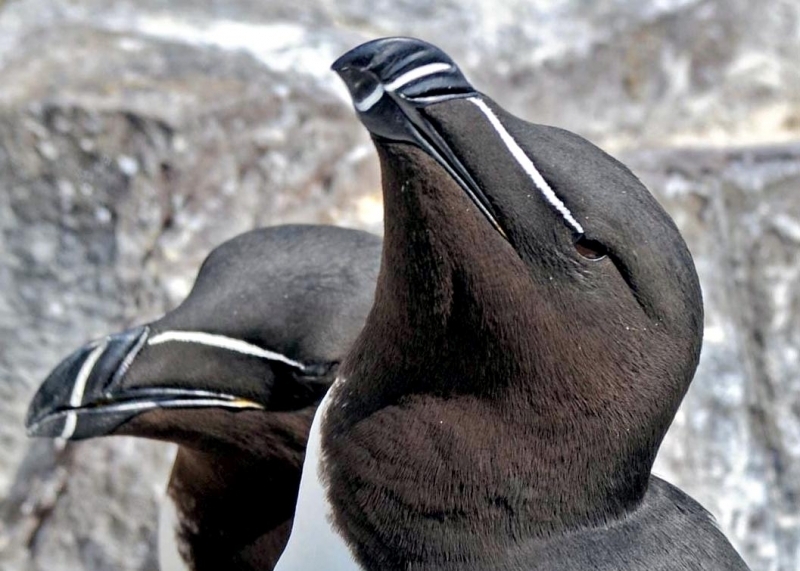 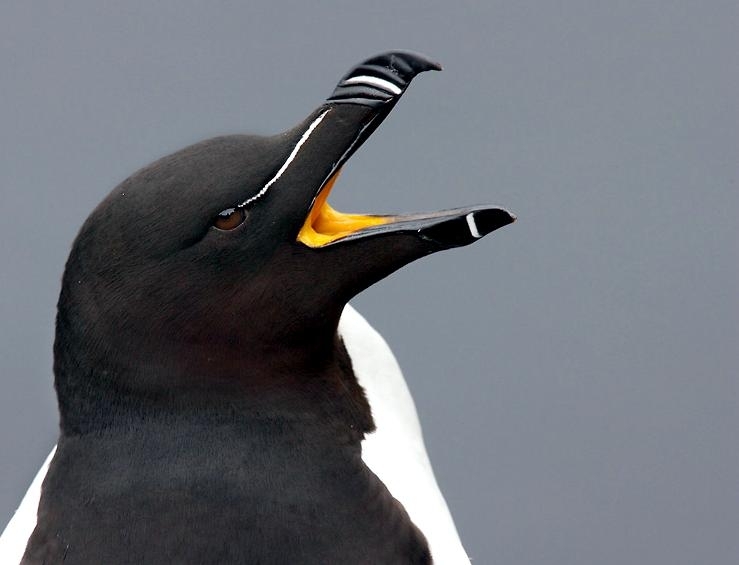 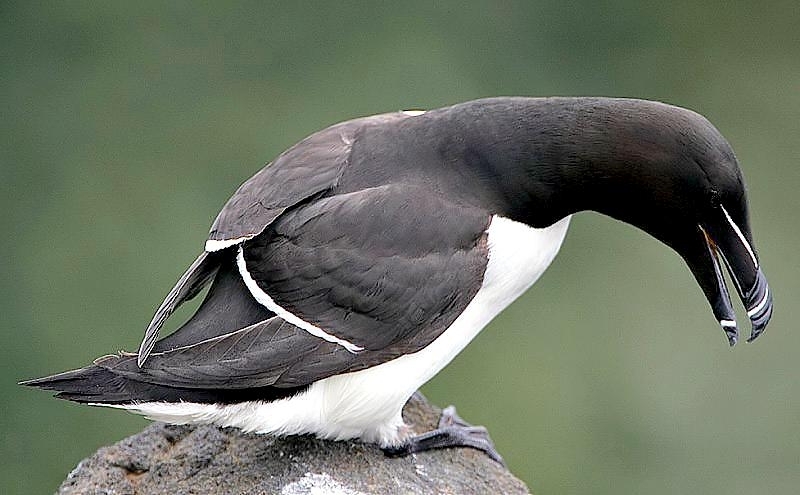 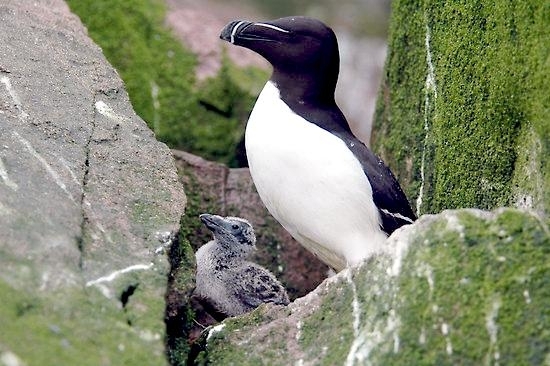 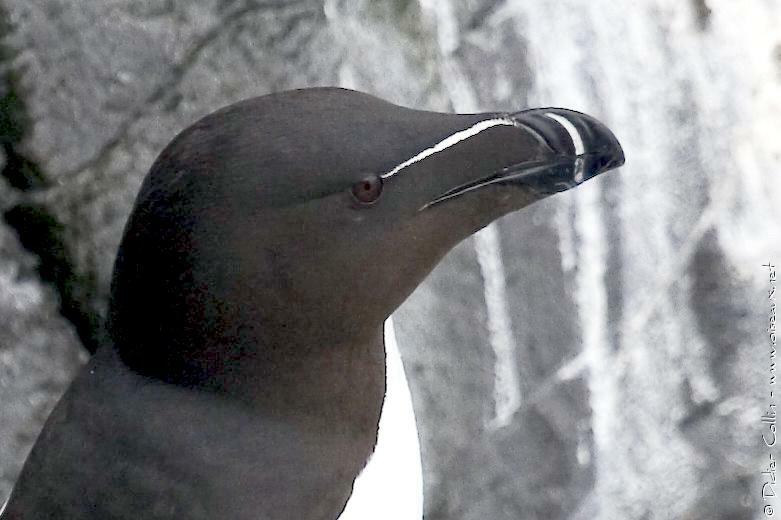 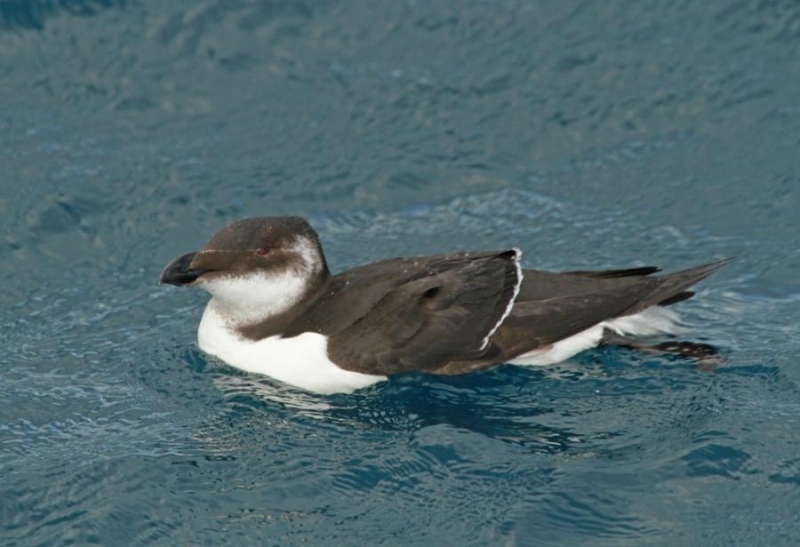 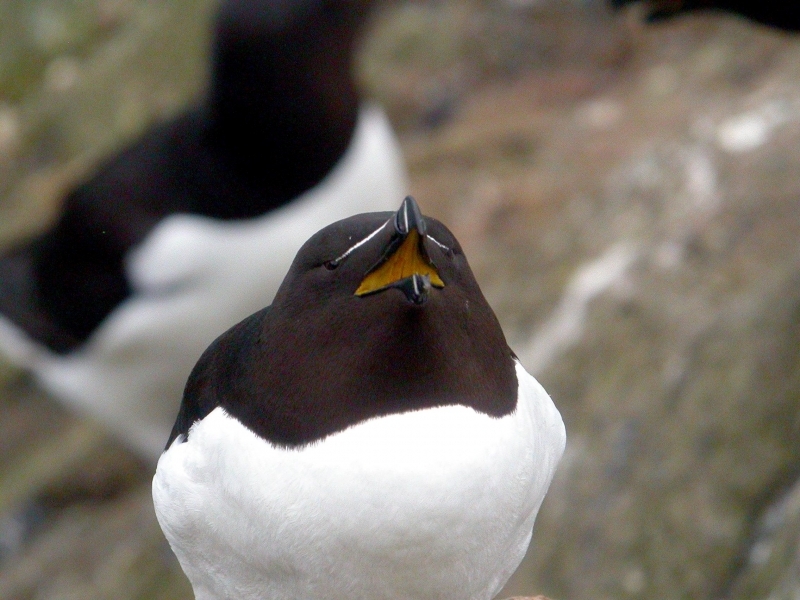 In autumn & winter, the Razorbill feeds on small fish from the surface waters of the Atlantic Ocean. 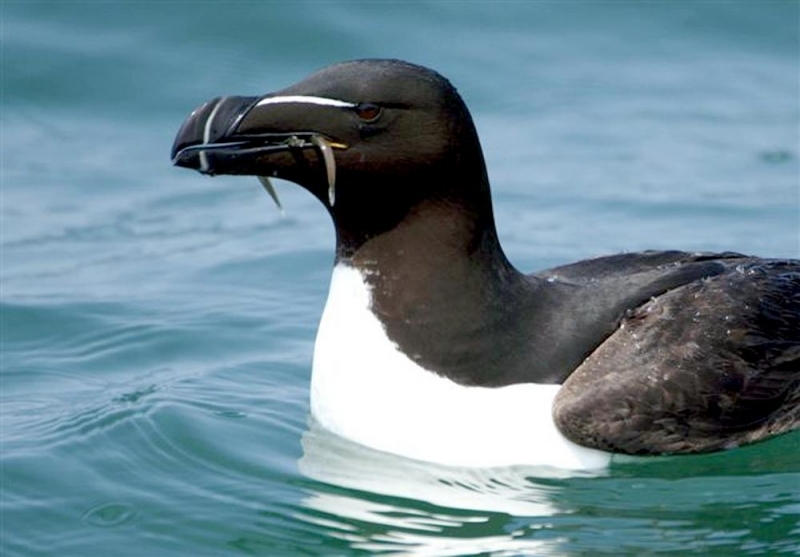 In spring & summer, it feeds in shallow water near its coastal nesting sites and often eats worms and mollusks as well as sand eels. 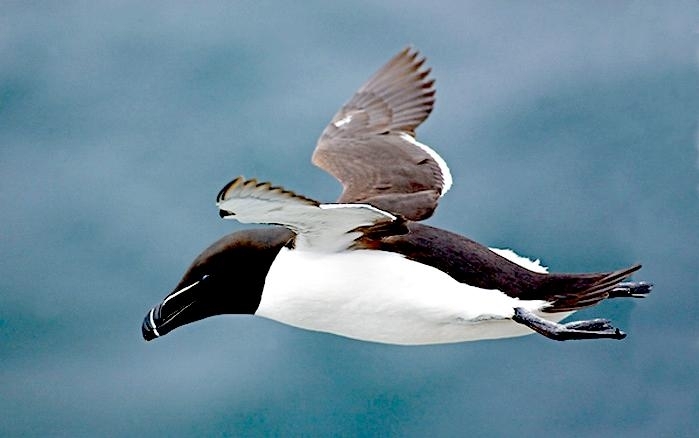 The Razorbill floats on the surface of the water like a duck, upending to feed. 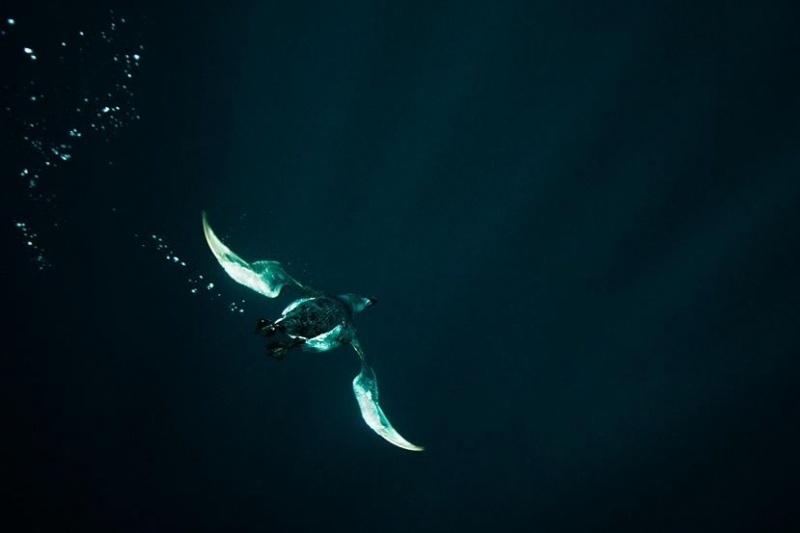 It dives to depths of 20 feet or more and sometimes stays submerged for nearly a minute. 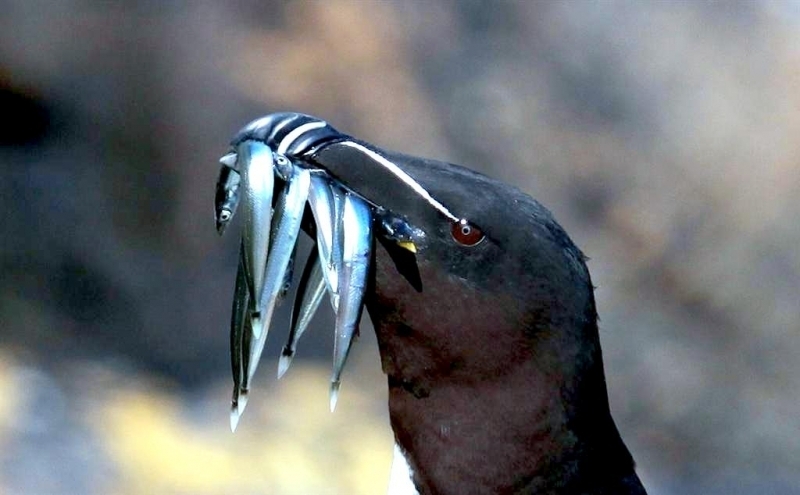 It catches fish in its sharp, hooked bill and swallows them underwater. 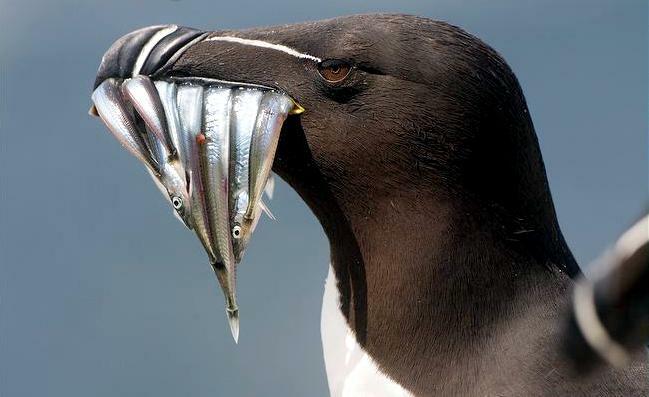 If it is feeding its young, it surfaces holding several fish in its bill and flies back to the nesting ledge. 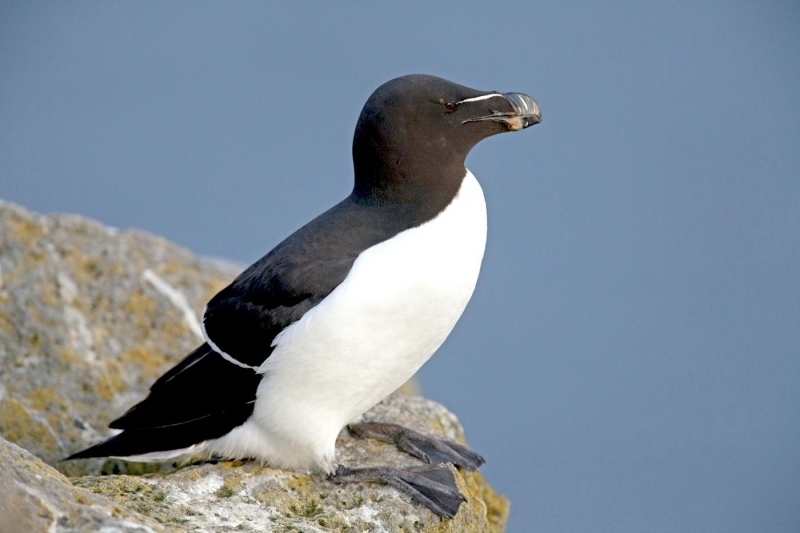 At these times, the Razorbill is vulnerable to attack, particularly by gulls that steal its catch. 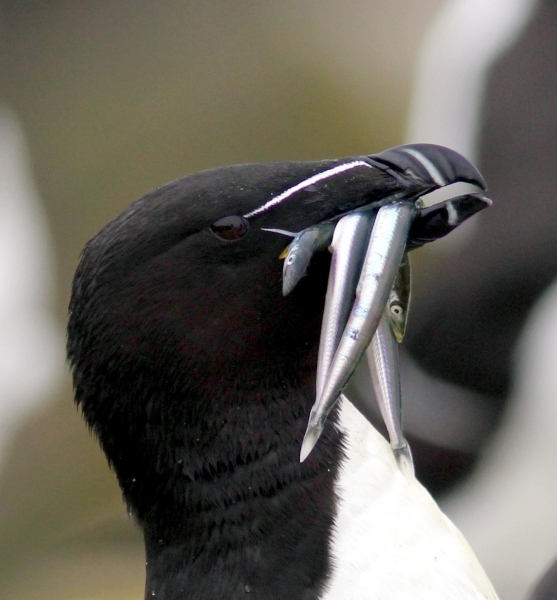 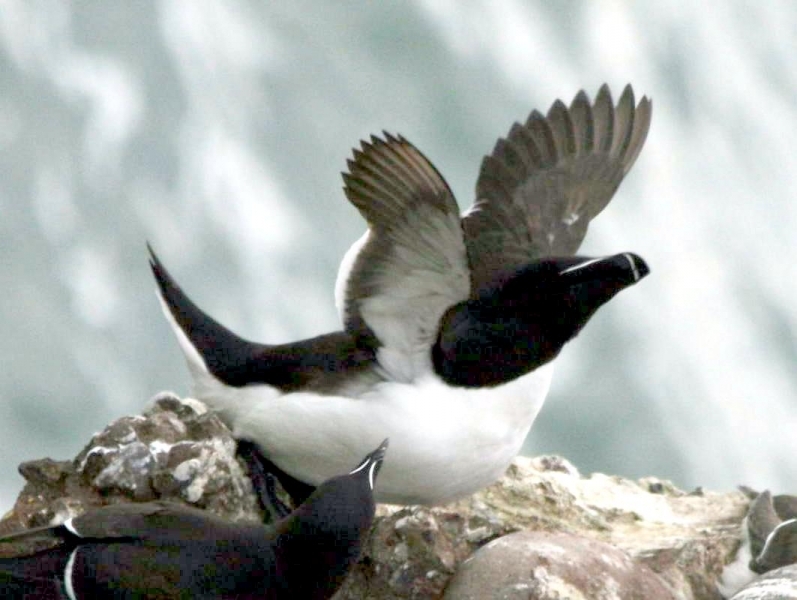 In turn, the Razorbill also steals food from other auks. 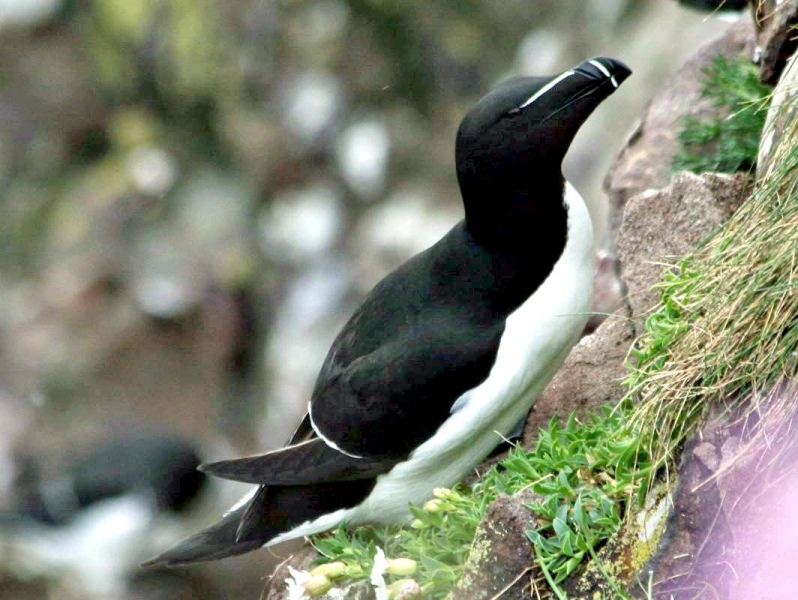 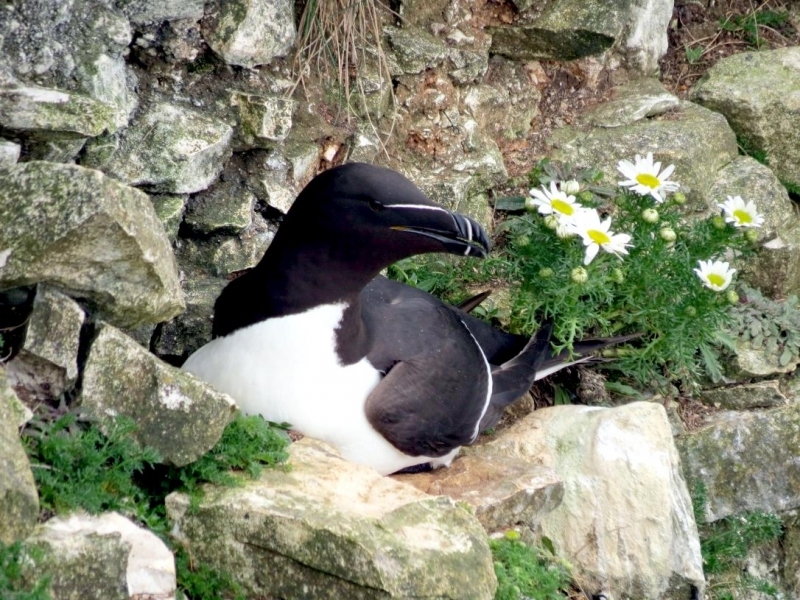 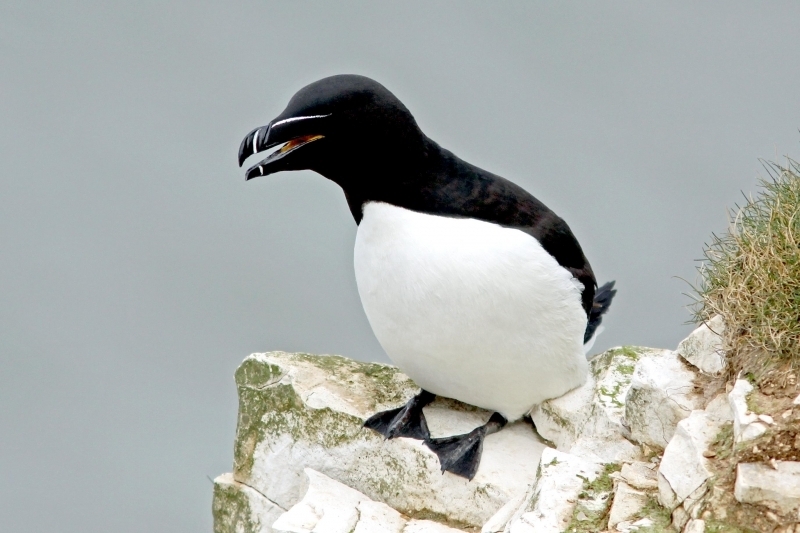 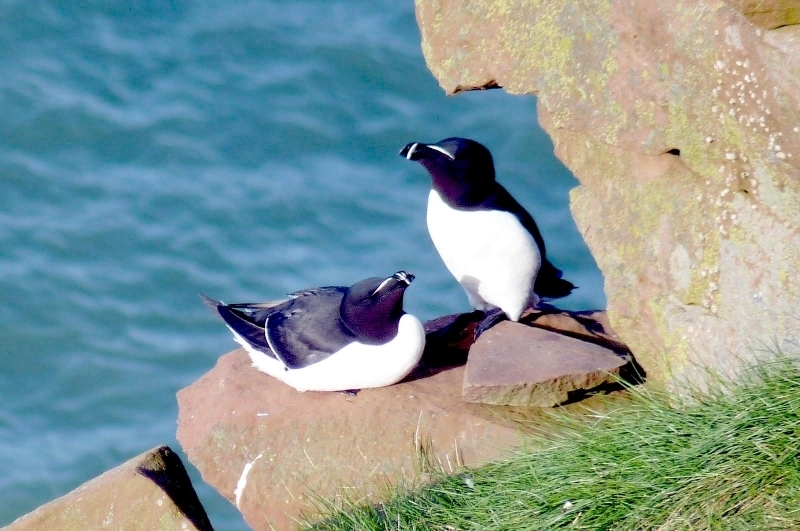 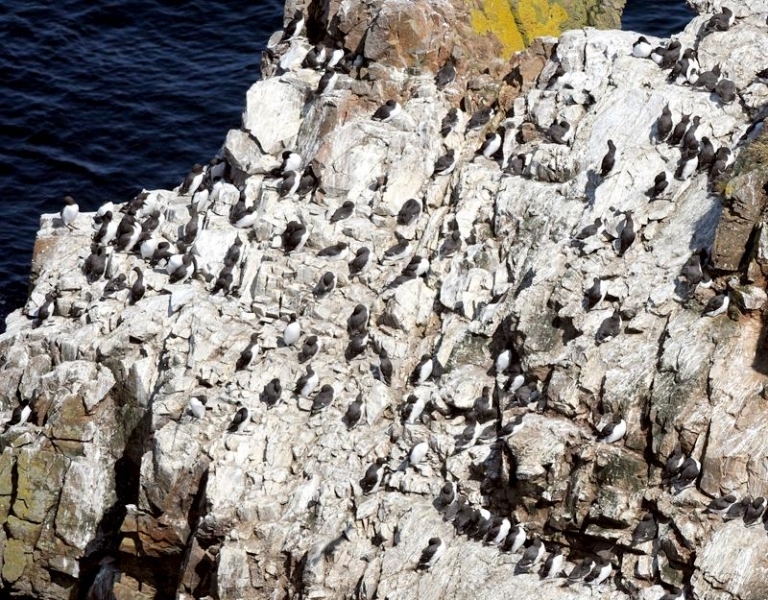 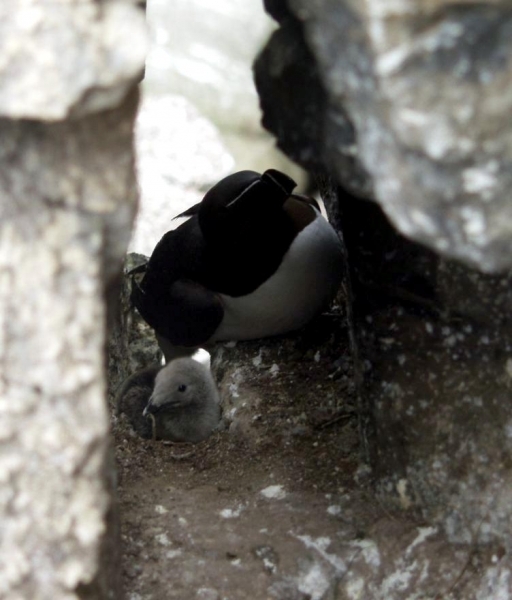 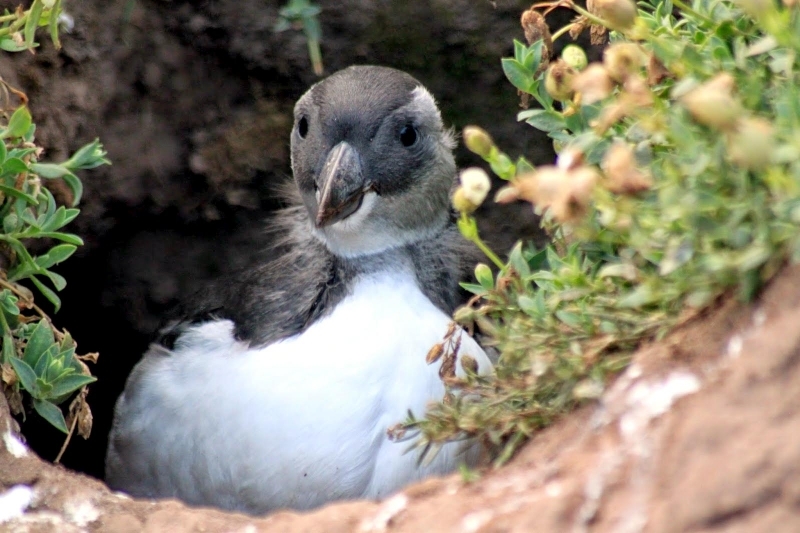 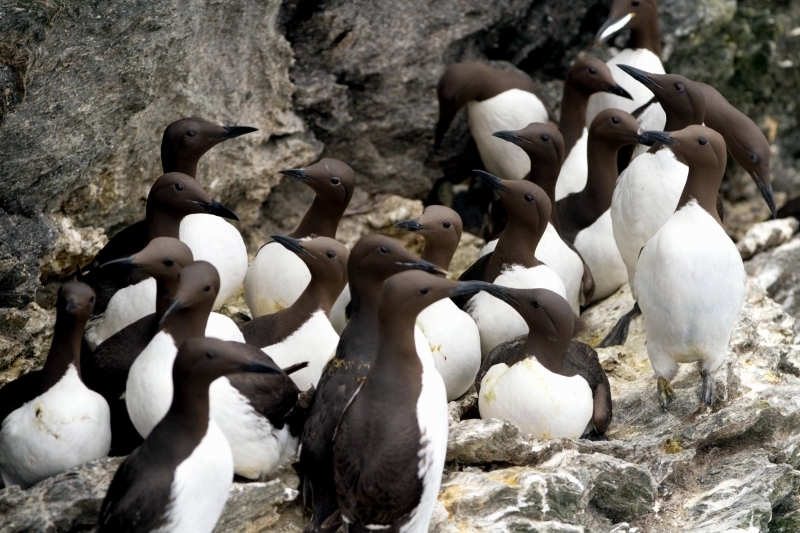 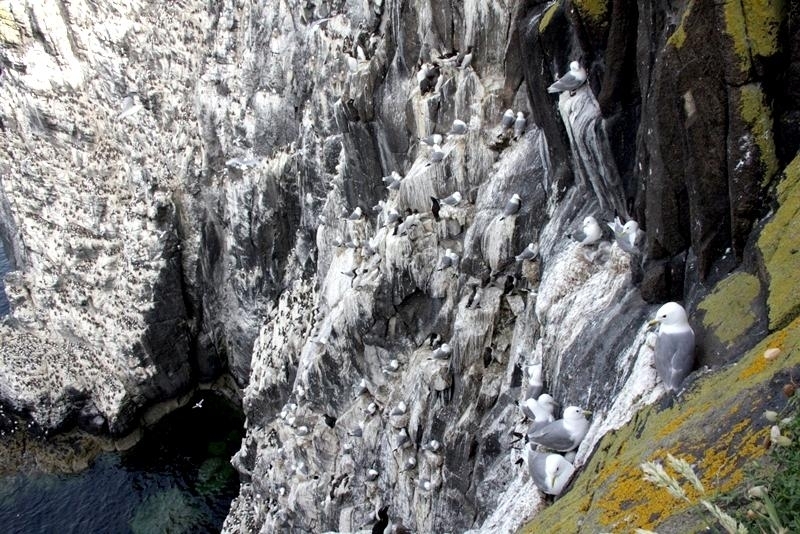 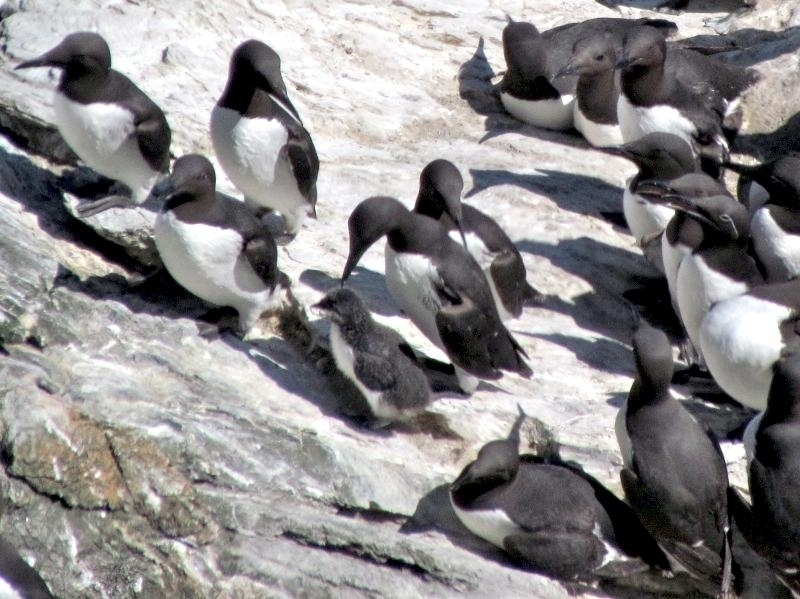 Razorbills breed in large colonies, each pair occupying a crevice on a cliff or rocky shore. 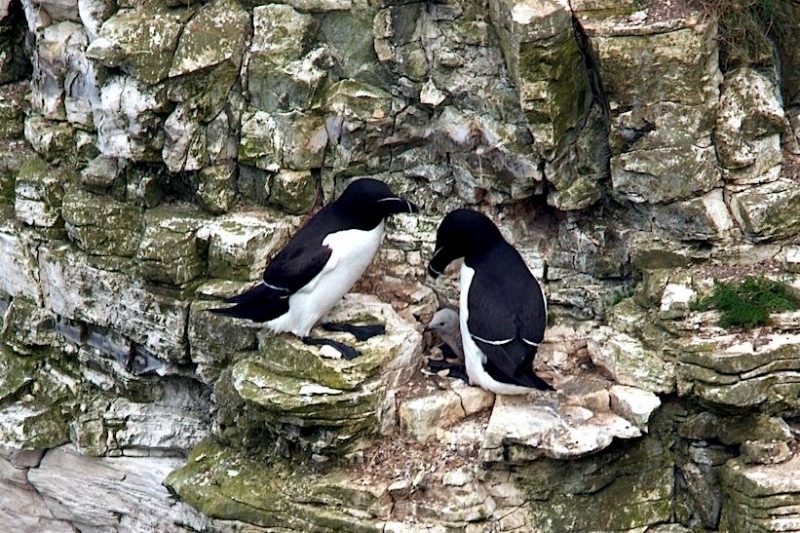 They form stable pairs that nest on the same sites each spring and part when the colony scatters in autumn. 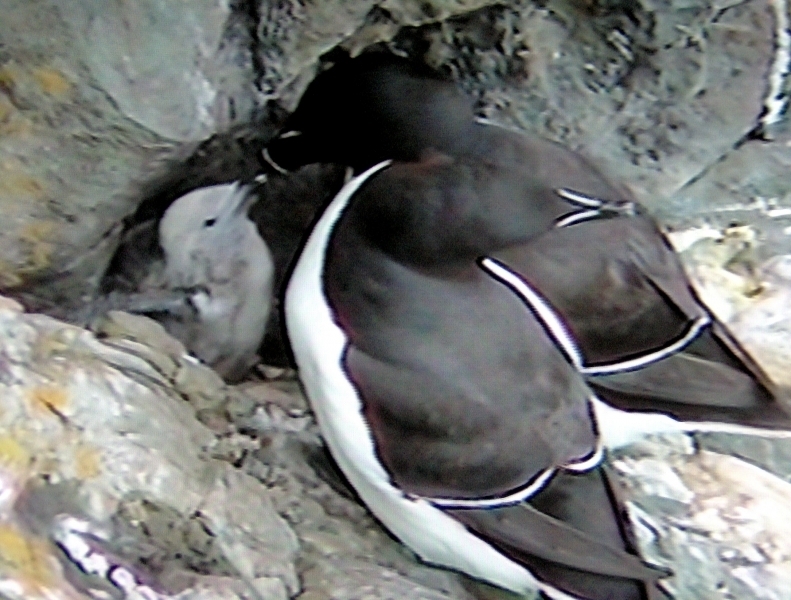 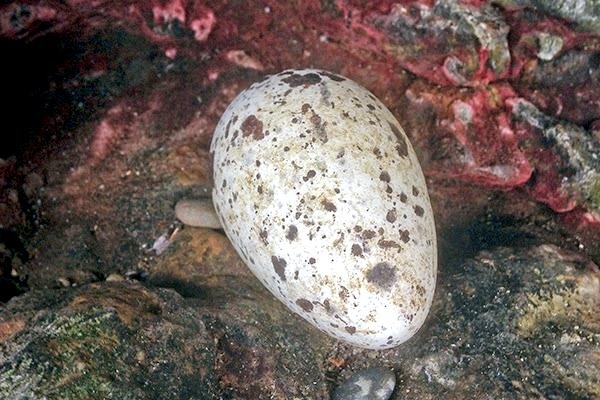 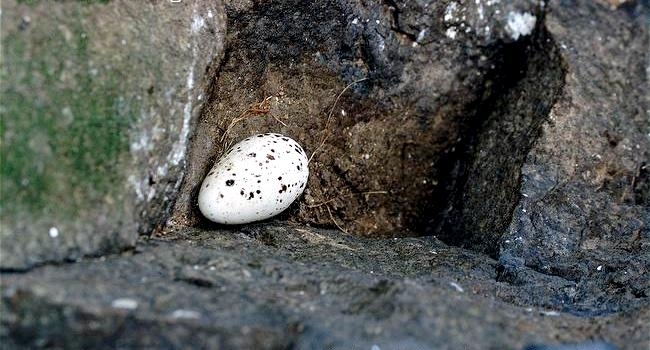 In late winter, each pair broods 1 egg laid directly on the bare rock. 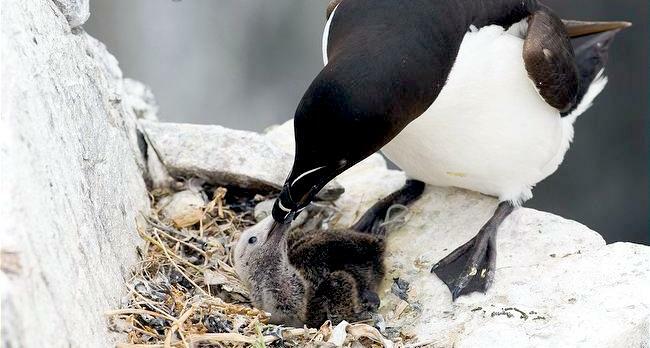 Both parents feed the chick. 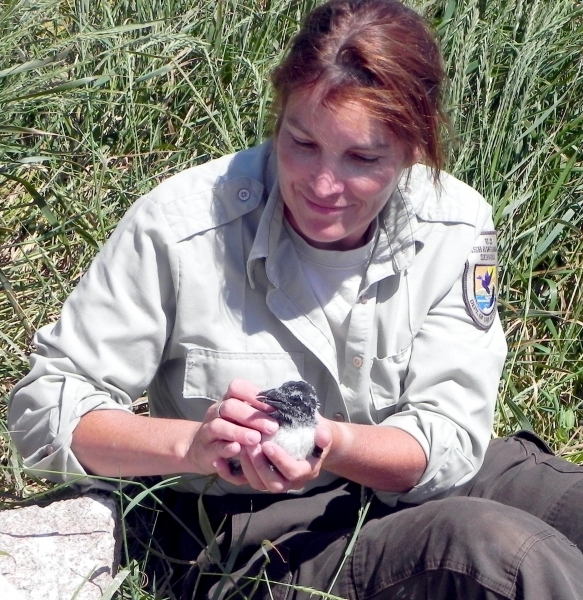 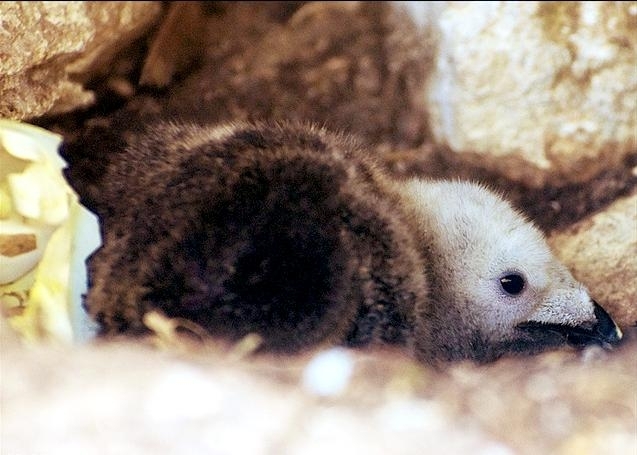 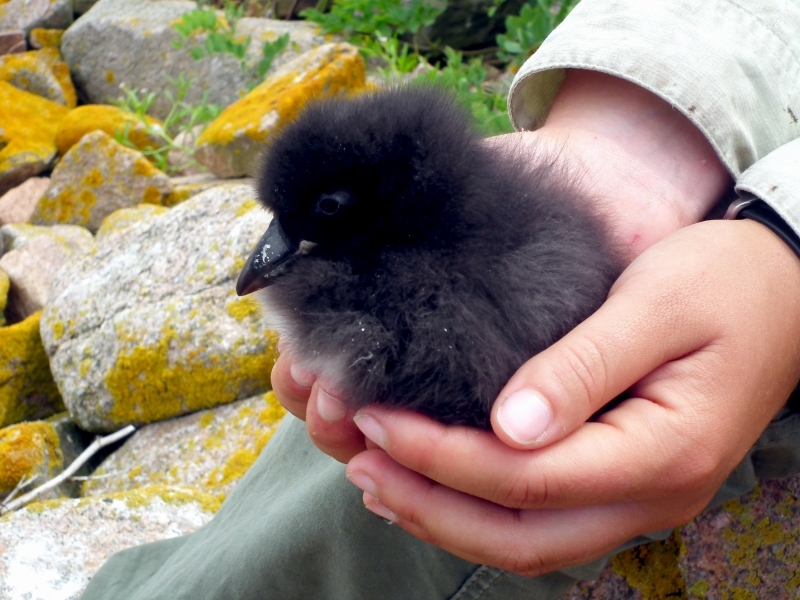 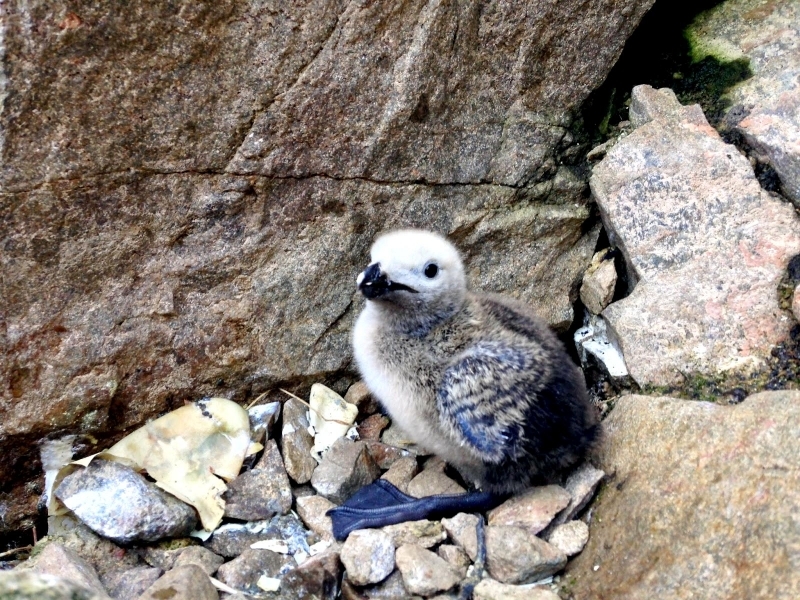 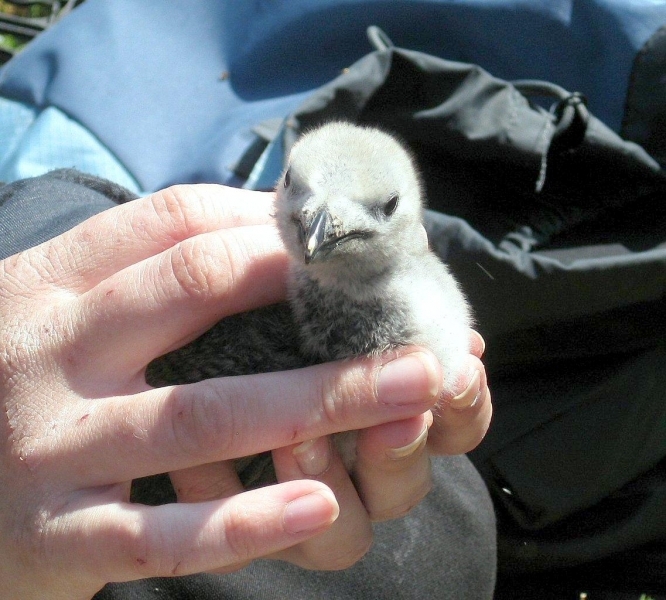 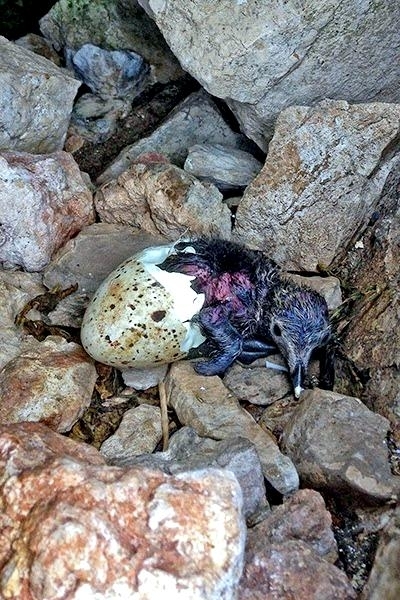 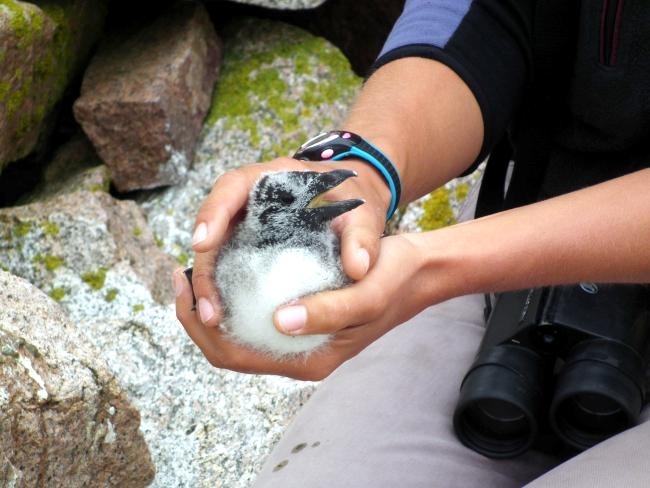 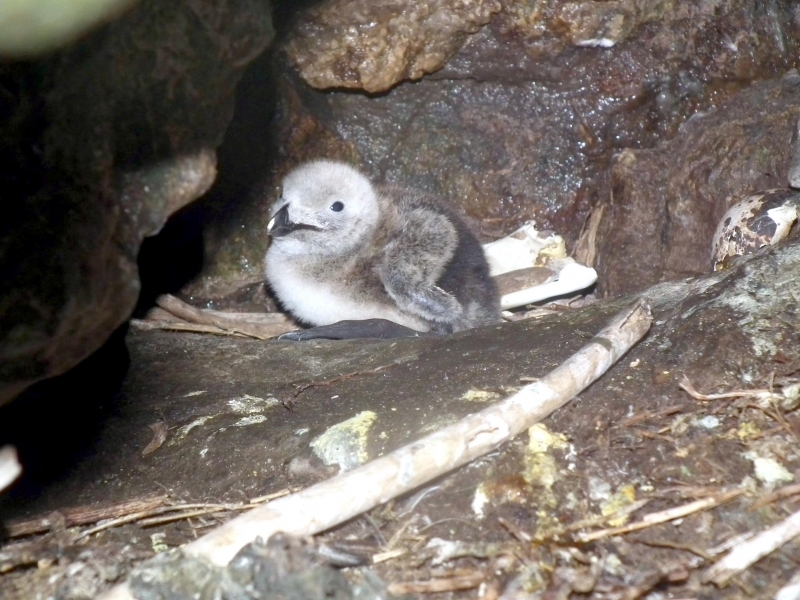 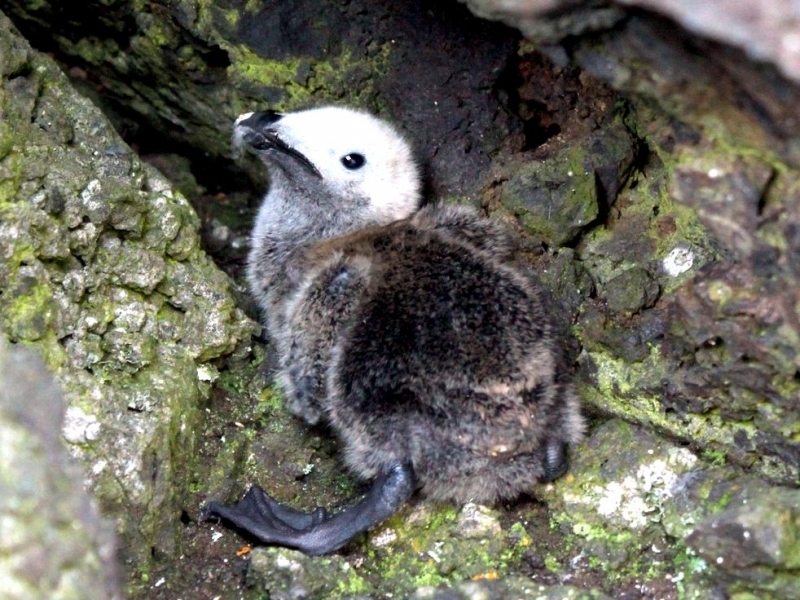 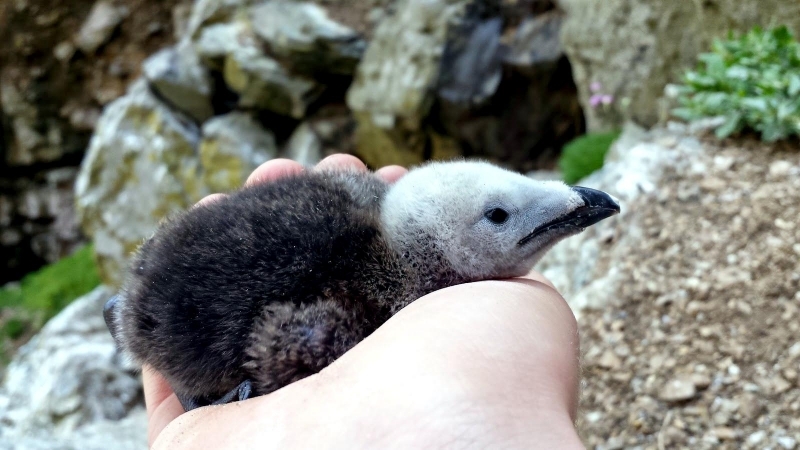 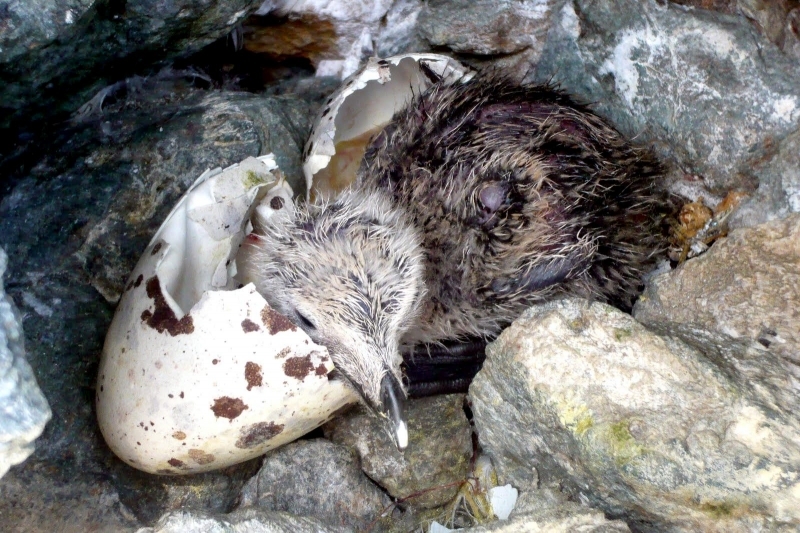 After about 18 days, the chick is only one fourth grown and still unable to fly. 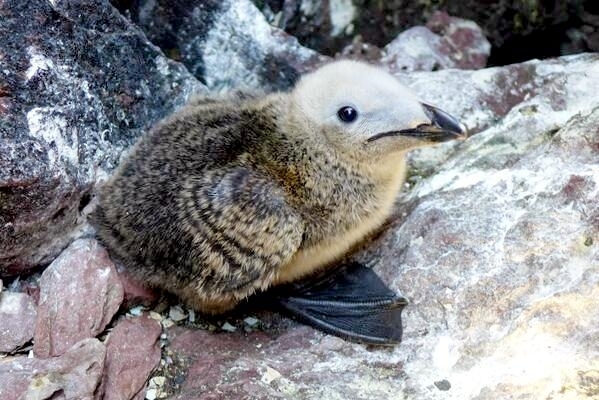 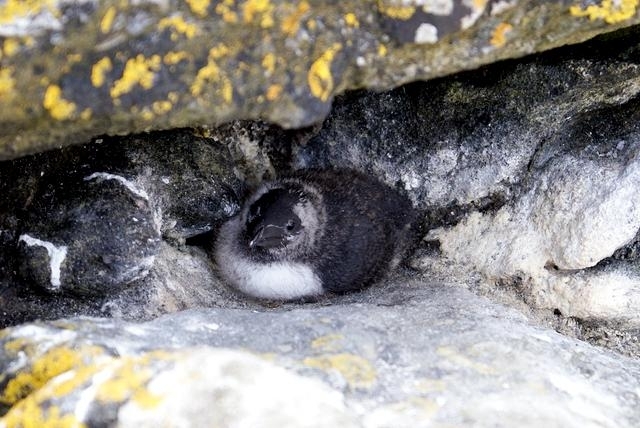 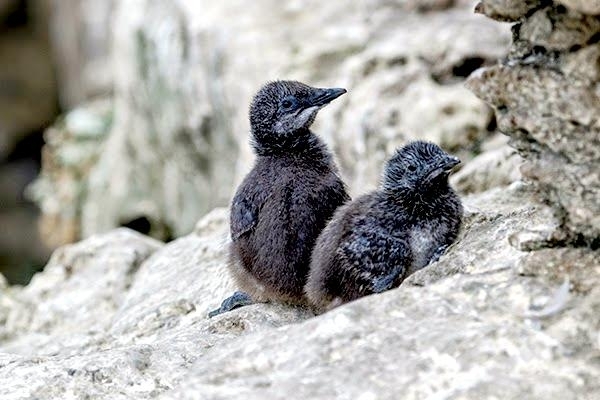 It leaves the ledge at night and goes down to the sea followed closely by the adult male, who continues to feed and care for it for several weeks until the young can hunt for itself. 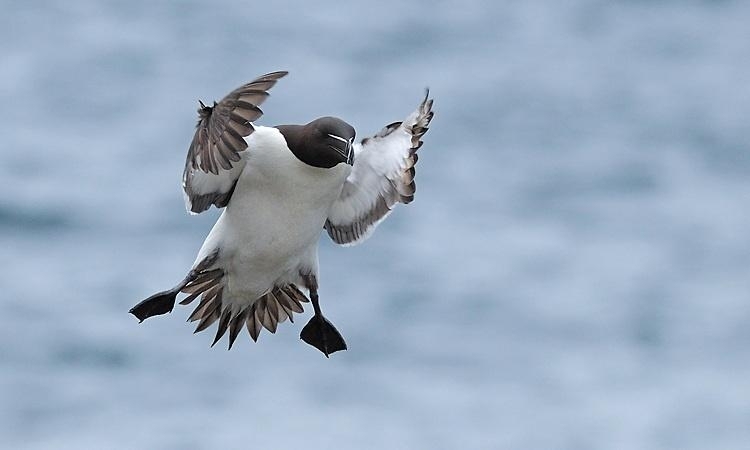 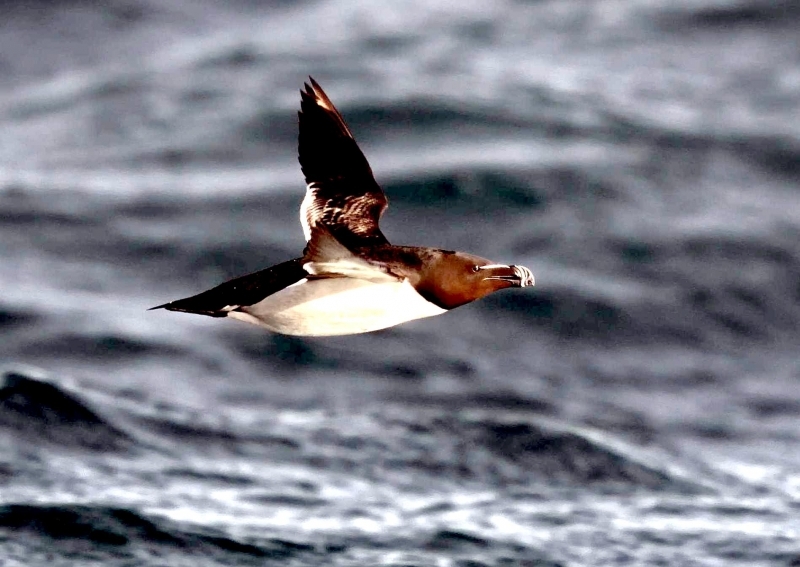 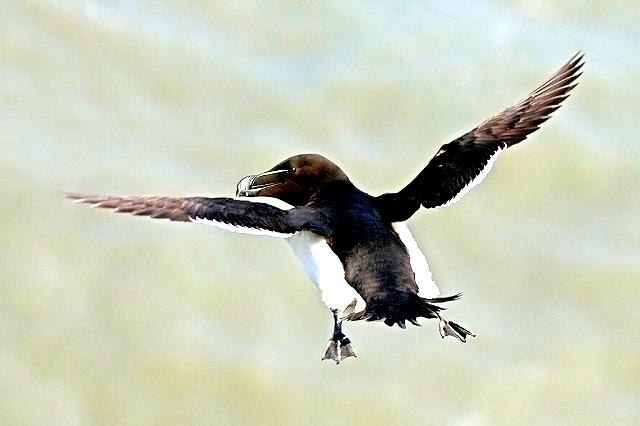 The Razorbill’s short wings are a compromise for both flying & swimming. 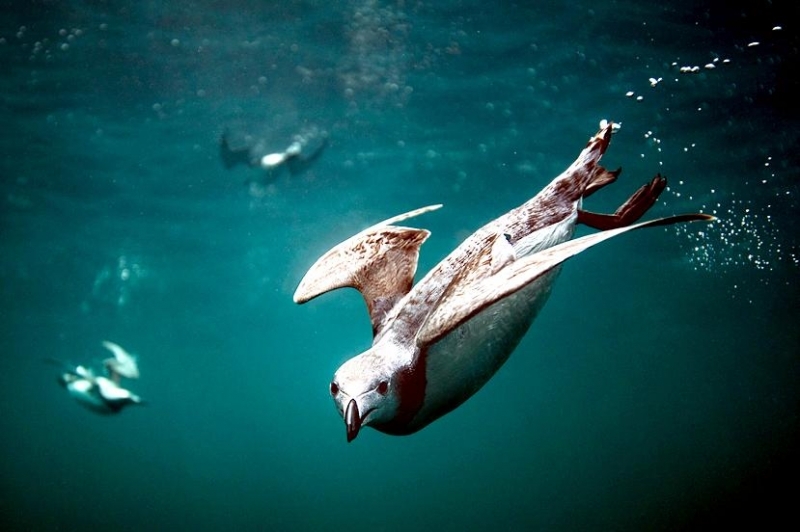 The large wings of many soaring birds are too bulky for use underwater. 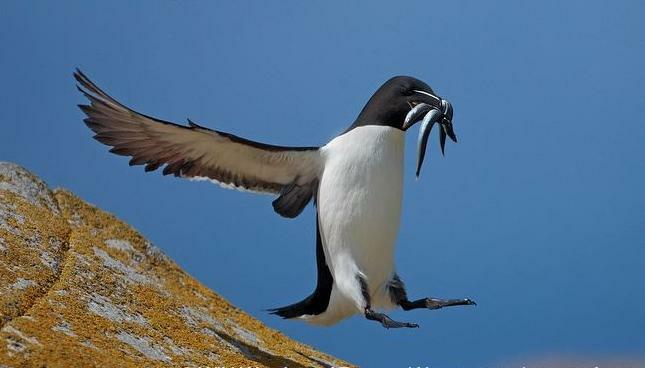 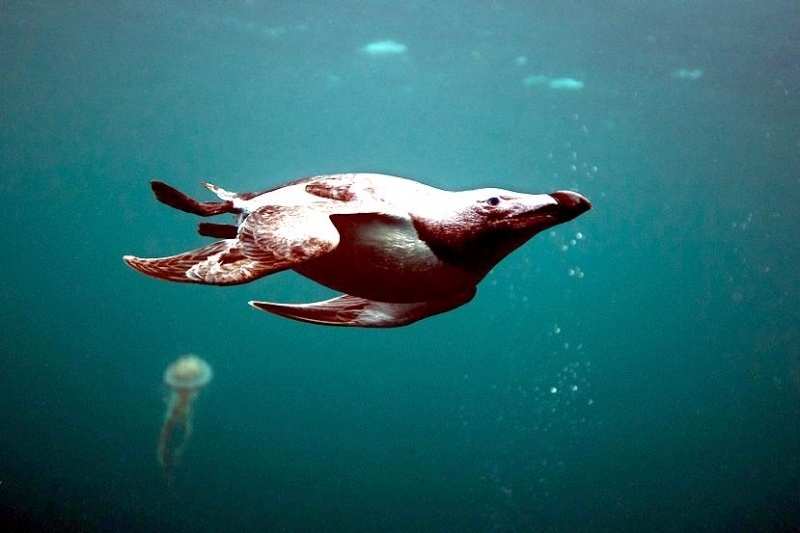 Conversely, the flipper like wings of penguins are too small for flight. 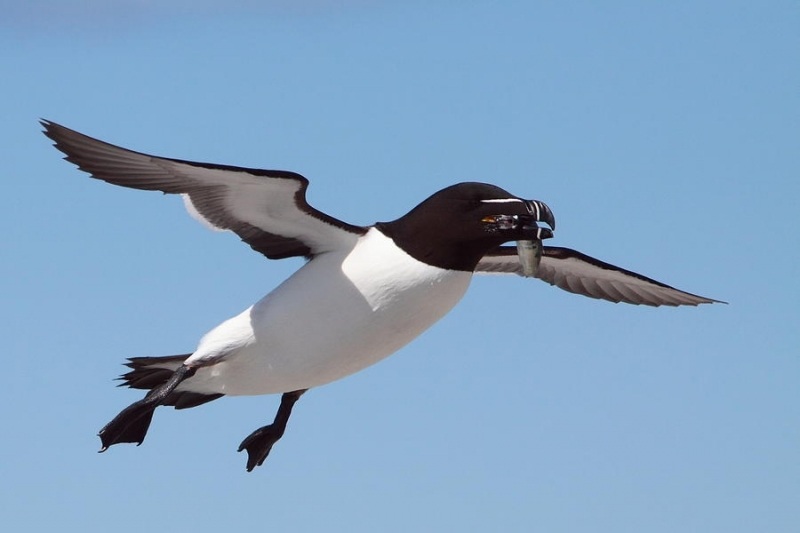 Although the short wings of the Razorbill work well underwater, they are just big enough to support it in the air. 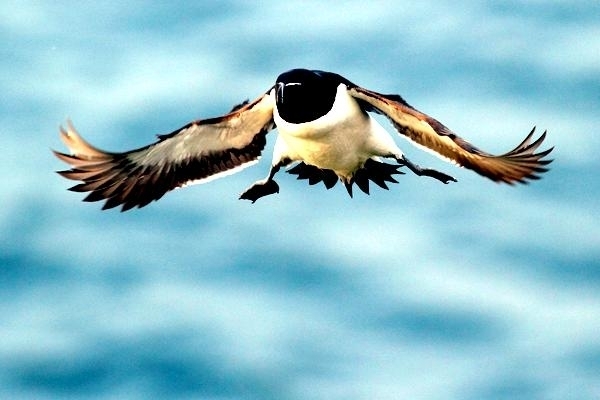 The loss of even a single wing feather makes flying difficult. 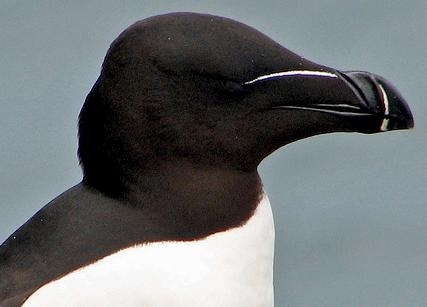 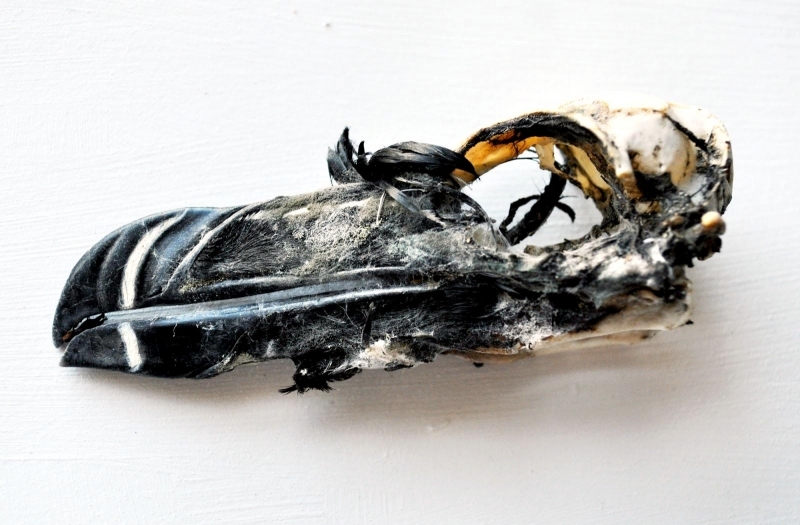 A Razorbill does not molt, replacing its flight feathers one by one like most birds. 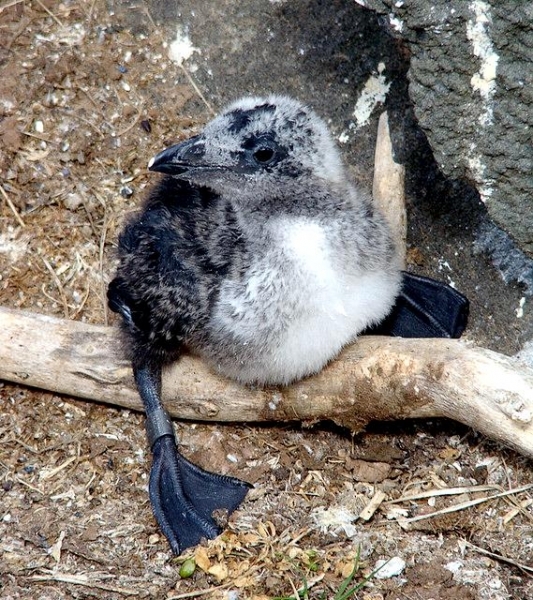 Instead, it molts them all at once after breeding season and is flightless for some 45 days.